Edita Gzoyan, Deputy Director of the Armenian Genocide Museum-Institute, participated at the international interdisciplinary conference Witness to the Age of Genocide: Raphael Lemkin and the Convention of 1948 organized by the Pilecki Institute on December 3-5, 2018 in Warsaw, Poland. The conference was organized in the memory of Raphael Lemkin, Polish-Jewish jurist, author of the term genocide and initiator of the Convention on the Prevention and Punishment of the Crime of Genocide adopted by the United Nations on 9 December 1948. Prof. Donna Lee-Frieze, Prof. William A. Schabas, Prof. Marek Kornat were among the speakers of the conference. Today, at the conference hall of the Armenian Genocide Museum-Institute Memorandum of understanding was signed between the вЂњArmenian Genocide Museum-InstituteвЂќ foundation and the Canadian Museum for Human Rights (CMHR). 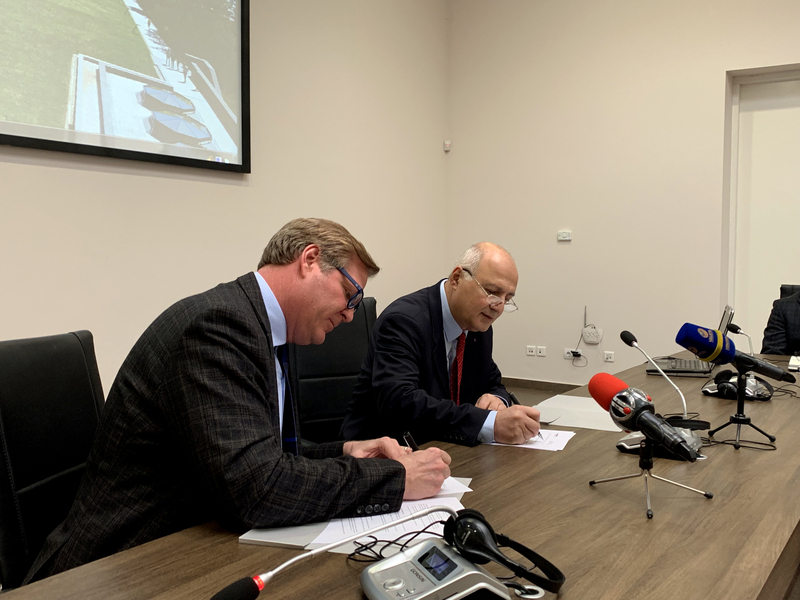 The memorandum was signed by Harutyun Marutyan, the Director of the Armenian Genocide Museum-Institute Foundation and John Young, the president of the Canadian Museum for Human Rights. Both organizations, having the promotion of human rights at the core of their activities, respect for others, reconciliation through education and dialogue, highlighted the importance of combining their efforts in these issues, and initiated the signing of memorandum of understanding. The MOU will provide opportunity for joint actions and cooperation in different concerned fields. A similar memorandum was signed between the two institutions in 2013, but this one provides broader cooperation platforms. On 27th of November, the exhibition вЂњArmenian Genocide and Scandinavian ResponseвЂќ was inaugurated at the Swedish Riksdag. 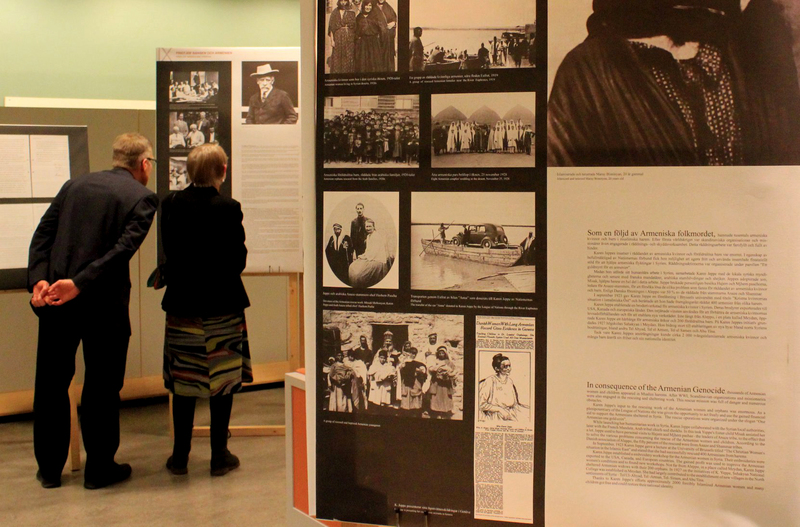 The temporary exhibition was prepared by the вЂњArmenian Genocide Museum-InstituteвЂќ foundation in 2011 and then provided to the Union of Armenian Associations in Sweden. The Riksdag exhibition is dedicated to the International Day of Commemoration and Dignity of the Victims of the Crime of Genocide and of the Prevention of this Crime and to the 70th anniversary of the UN Convention on the Prevention and Punishment of the Crime of Genocide. The parliamentarians, ambassadors and diplomats accredited in Stockholm, Swedish public figures, representatives of mass media were present at the inauguration of the exhibition.The exhibition will run until 20th of December 2018. On November 28, the participants of PABSEC Plenary Session visited the Armenian Genocide Memorial Complex. The guests were welcomed by Dr. Harutyun Marutyan, the Director of the Armenian Genocide Museum-Institution Foundation, and Lusine Abrahamyan, the Deputy Director of the Museum, who also introduced the history of construction of the memorial complex and its symbolism. The guests put flowers at the eternal fire honoring the memory of the innocent martyrs of the genocide. The members of the delegation also visited the Armenian Genocide Museum, got acquainted with the documents on the Armenian Genocide, observed the exhibits and left a note in the Book of Honorable Guests. Journalists who arrived in Yerevan from various German leading news agencies visited the Armenian Genocide Museum. The guests were accompanied by Edita Gzoyan, the Deputy Director of the Genocide Museum Institute. Dr. Gzoyan has introduced the history of the Armenian Genocide and answered the questions of the journalists. After the visit of the Museum, the guests also attended the Armenian Genocide Memorial Complex, paid tribute to the memory of the innocent martyrs of the genocide. The Journalists are in Yerevan within the framework of the project carried out by the Secretariat of the Armenian National Platform of the Eastern Partnership Civil Society Forum and the вЂњGerman SocietyвЂќ NGO. At the invitation of Yerevan Mayor Hayk Marutyan, on November 18, the delegation headed by the President of Ile-de France Regional Council Valerie PГ©cresse accompanied by the Deputy Mayor Sergey Harutyunyan visited the Armenian Genocide Memorial Complex. The Guests were welcomed by Harutyun Marutyan, the director of the AGMI Foundation, who also introduced the history of construction of the memorial complex and its symbolism. Mrs. PГ©cresse laid a wreath at the Memorial, and put flowers at the eternal fire honoring the memory of the innocent martyrs of the genocide. 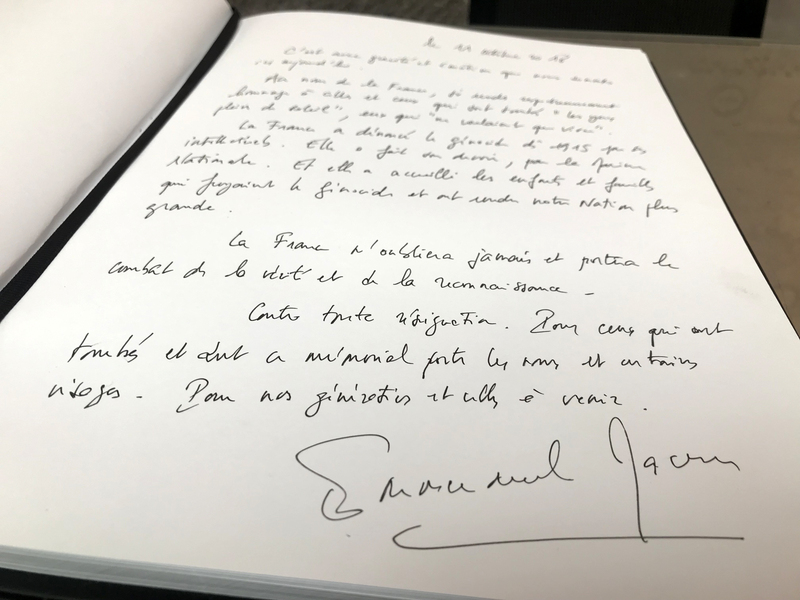 Jonathan LacГґte, Ambassador Extraordinary and Plenipotentiary of the French Republic to the Republic of Armenia, expressed his gratitude to the Armenian Genocide Museum-Institute Foundation, especially to its director Harutyun Marutyan, for properly accepting the French delegations, particularly President Emmanuel Macron and Mrs. Brigitte Macron, within the framework of the XVII Francophone Summit in Yerevan. 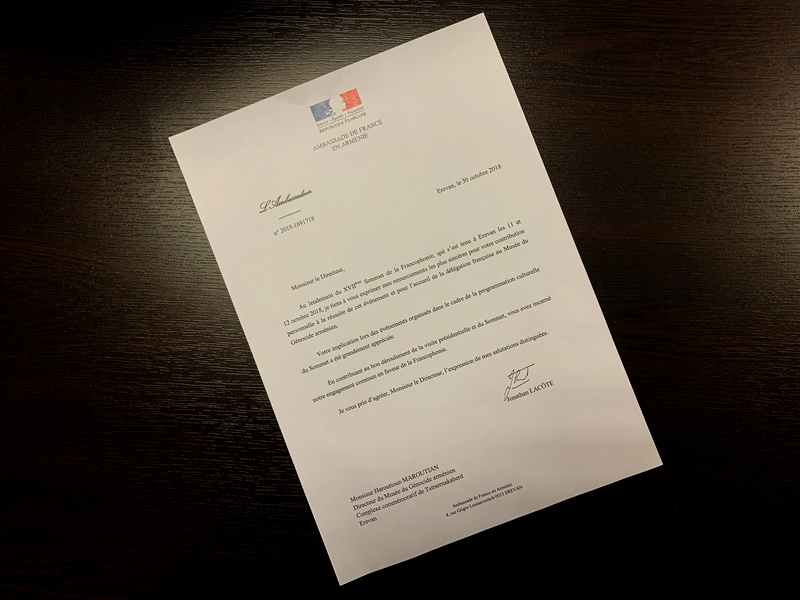 вЂњYour involvement in the cultural program of the Summit has been greatly appreciated and by contributing to the smooth running of the presidential visit and the Summit, you have embodied our common commitment for the sake of FrancophonieвЂќ- the letter says. The Armenian Genocide Museum-Institute foundation announces competition to design its new Logo. The submitted works should include an image of the Armenian Genocide Memorial Complex. Projects must be submitted electronically, in monochrome and colored versions. The winner will be awarded a certificate of appreciation, and an official publication will be put at the AGMI official web site. The applications are accepted form Armenia, as well as abroad. The winner will be chosen by a professional committee of experts. On October 24-27, AGMI researcher Dr. Shushan Khachatryan participated in the annual international conference in Monastery of Bose. 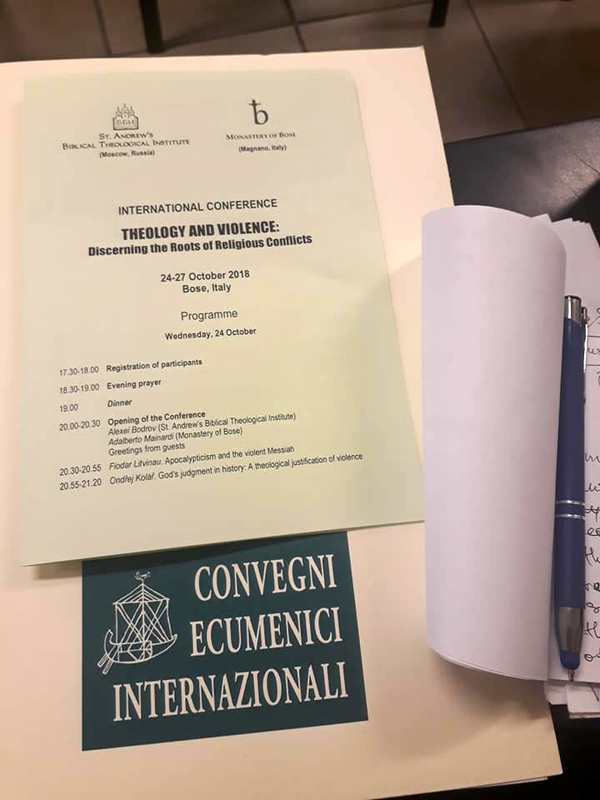 This year the conference was titled вЂњTheology and Violence: Discerning the Roots of Religious ConflictsвЂќ. Shushan Khachatryan presented paper entitled вЂњThe Syndrome of CainвЂќ: Genocide as a Sacrificial PhenomenonвЂќ, where issues of religious and theological interpretation of genocides are touched upon, and the author suggests putting into use a new phenomenological term- вЂњthe Syndrome of CainвЂќ. The conference was organized by St. Andrew's Biblical and Theological Institute (Moscow, Russia) and the Monastery of Bose (Magnano, Italy). 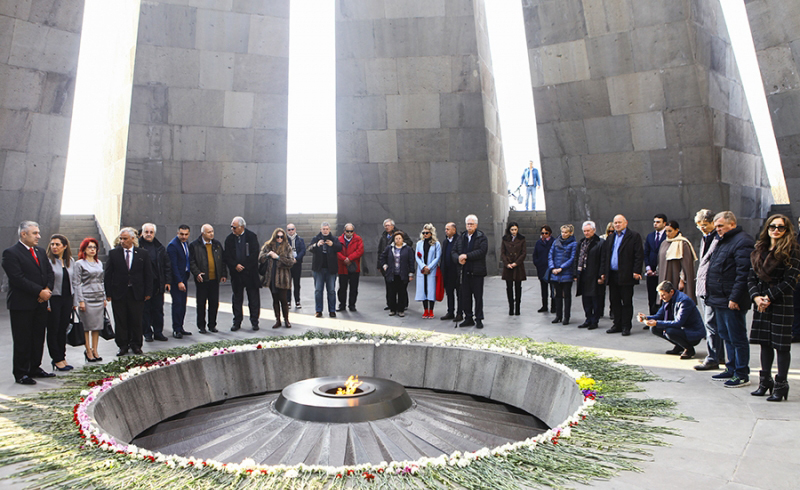 Delegations from various cities that arrived in Yerevan to participate in the events dedicated to the 2800th anniversary of the foundation of Yerevan also visited the Armenian Genocide Memorial Complex on October 21. 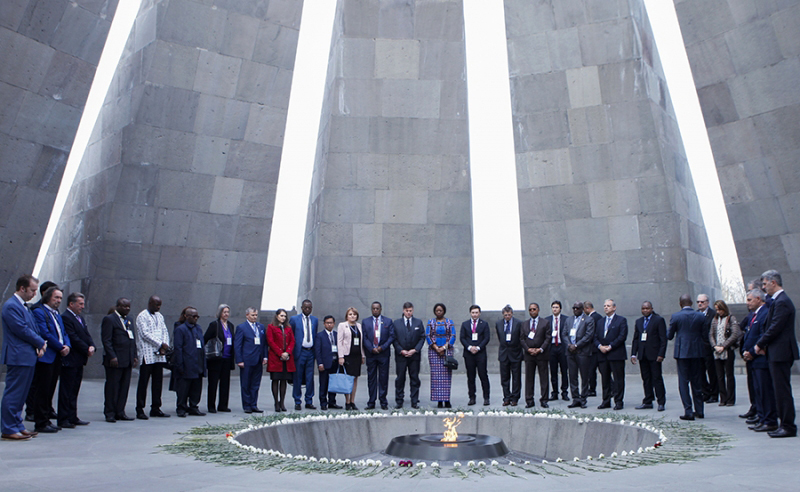 On behalf of the Delegation a wreath was laid at the Memorial, and the members of delegation put flowers at the eternal fire honoring the memory of the innocent martyrs of the genocide. 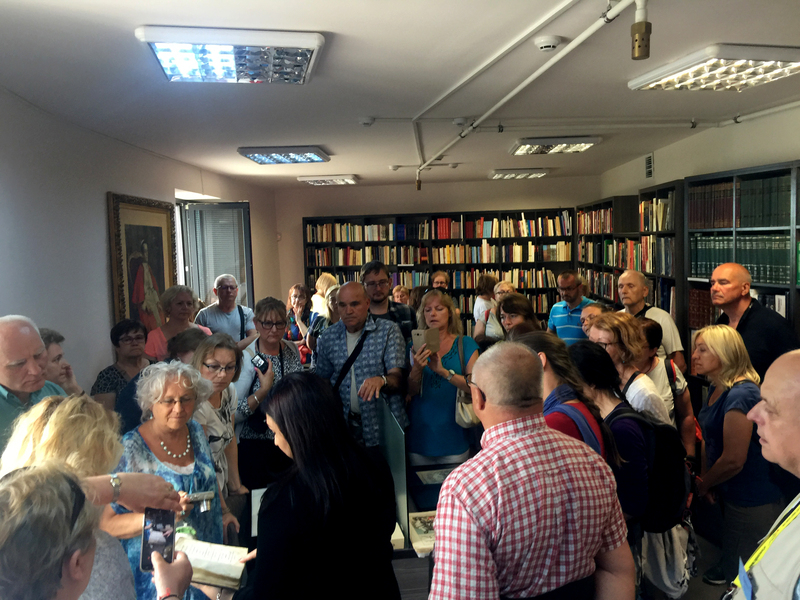 The guests also visited the Armenian Genocide Museum, got acquainted with the exhibition, and after the tour they left a note in the Memory Book of the museum. The heads of the delegations that have arrived in Armenia to attend a meeting of the CIS Council of Heads of Penitentiary Services, visited the Armenian Genocide Memorial Complex accompanied by Artyom Mkhoyan, Head of Penitentiary Service of the RA Ministry of Justice. The guests from the CIS member Stated were welcomed by Harutyun Marutyan, the AGMI director, who also introduced to the guests the history of construction of the memorial complex and its symbolism. 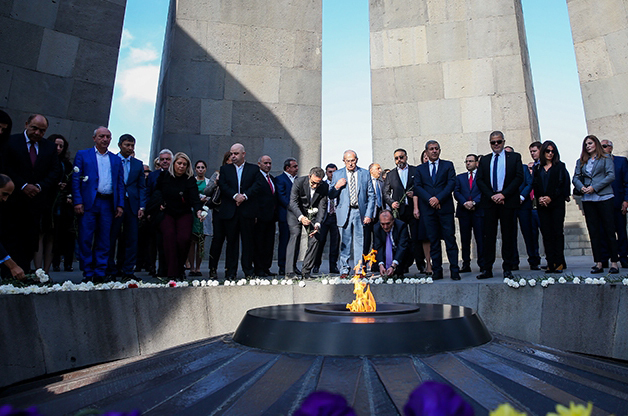 The representatives of the delegation laid a wreath at the Memorial, and put flowers at the eternal fire honoring the memory of the innocent martyrs of the genocide. 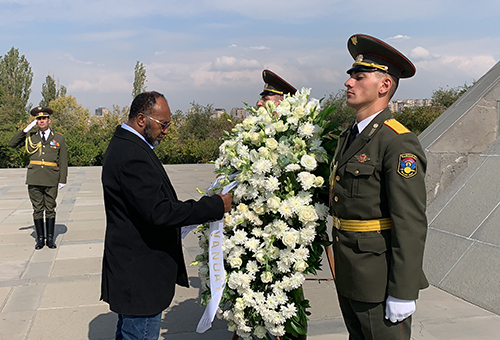 The Prime Minister of the Republic of Vanuatu Charlot Salwai, who arrived in Armenia on an official visit within the XVII Francophone Summit, visited the Armenian Genocide Memorial Complex accompanied by Aramayis Grigoryan, the Deputy Minister of Diaspora of the RA. The guests from Vanuatu were welcomed by Harutyun Marutyan, the director of Armenian Genocide Museum-Institute, who also introduced to the guests the history of construction of the memorial complex and its symbolism. The Prime Minister of Vanuatu laid a wreath at the Memorial, and with the members of delegation put flowers at the eternal fire honoring the memory of the innocent martyrs of the genocide. The Prime Minister of Canada Justin Trudeau accompanied by Zohrab Mnacakanyan, the Minister of Foreign Affairs of the RA, Levon Martirosyan, The Ambassador of The Republic of Armenia to Canada, Kamo Areyan, the deputy Mayor of Yerevan, and the representatives of the Armenian community in Canada visited the Armenian Genocide Memorial Complex. The guests were welcomed by the AGMI director Harutyun Marutyan, who also introduced to the guests the history of construction of the memorial complex and its symbolism. 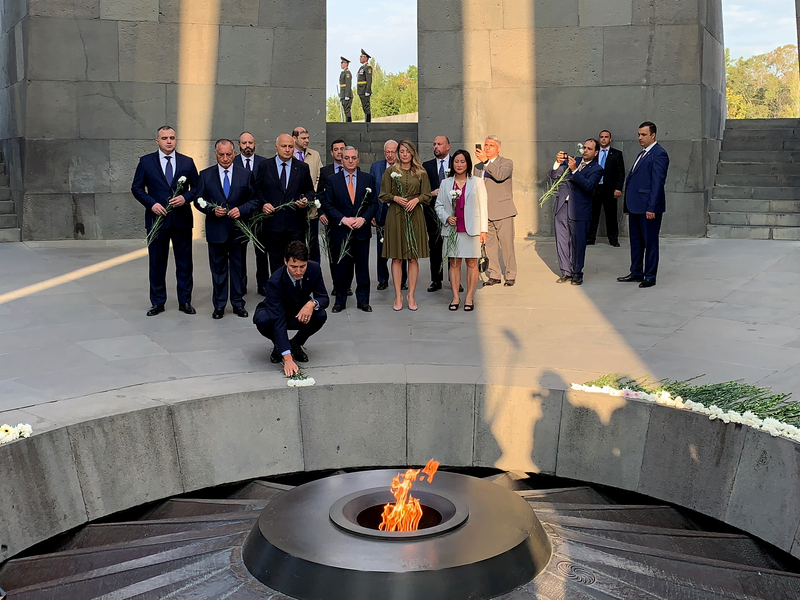 The Prime Minister of Canada laid a wreath at the Memorial, and with the members of delegation put flowers at the eternal fire honoring the memory of the innocent martyrs of the genocide. The Prime Minister of Quebec FranГ§ois Legault, who arrived in Armenia on an official visit within the XVII Francophone Summit, visited the Armenian Genocide Memorial Complex accompanied by Armen Papikyan, the Deputy Foreign Minister of the RA. The newly appointed Prime Minister of Quebec laid a wreath at the Memorial, and with the members of delegation put flowers at the eternal fire honoring the memory of the innocent martyrs of the Armenian Genocide. The guests from Quebec were welcomed by Harutyun Marutyan, the director of the Armenian Genocide Museum-Institute, who also introduced to the guests the history of construction of the memorial complex and its symbolism. On October 11, within the framework of his visit to вЂњCharles AznavourвЂќ residence in Yerevan the President of the French Republic Emmanuel Macron, accompanied by his wife, Brigitte Macron, highlighted Aznavour's struggle for the recognition of the Armenian Genocide and designated April 24 to be the Armenian Genocide Remembrance Day in France. вЂњI canвЂ™t find the words to describe what we felt this morning at the Armenian Genocide Memorial. The one who knows France since 1915 condemned the Genocide through the voice of Anatol Franc, send his third naval crew to save thousands of people. The one who fought for the recognition of the Genocide by law in France in 2001. Together with the Diaspora we will continue Charles Aznavour's struggle for the recognition of the Armenian Genocide by the international community. The Prime Minister of the Kingdom of Belgium Charles Michel, who arrived in Armenia on an official visit within the XVII Francophone Summit in Yerevan, visited the Armenian Genocide Memorial Complex. The Prime Minister was accompanied by Karen Nazaryan, the Deputy Foreign Minister of the RA, and Harutyun Marutyan, the director of the Armenian Genocide Museum-Institute. 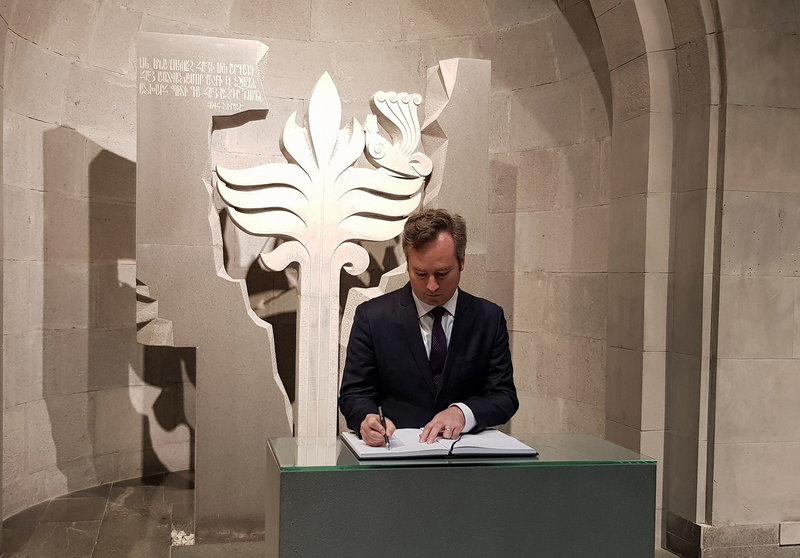 The Prime Minister of Belgium laid a wreath at the Memorial, and with the members of delegation put flowers at the eternal fire honoring the memory of the innocent martyrs of the Armenian Genocide. 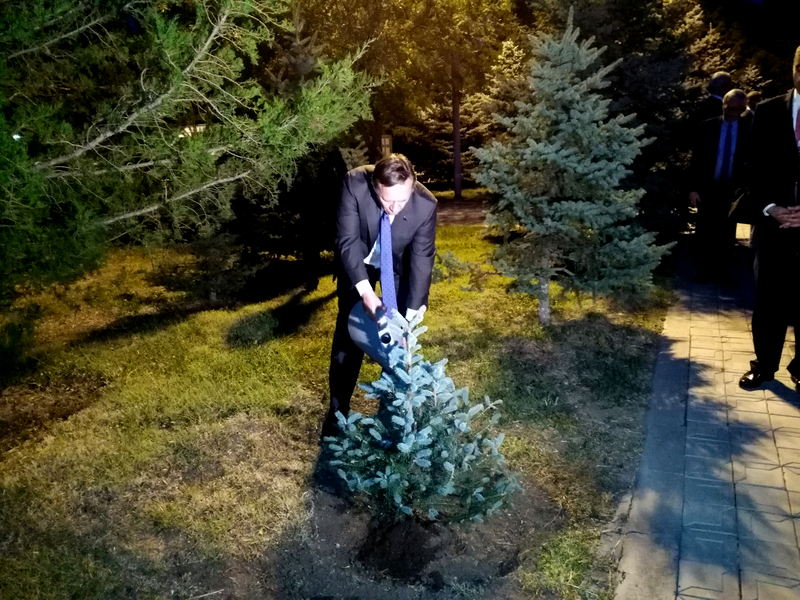 The members of the Belgian delegation also made a tour in the Memory Alley, where the Prime Minister planted a silver fir in memory of the victims of the Armenian Genocide. French President Emmanuel Macron and his wife Brigitte Macron visit the Armenian Genocide Memorial Complex. The President of France was accompanied by Zohrab Mnacakanyan, the Minister of Foreign Affairs of the RA, Arayik Harutyunyan, the Minister of Education and Science of the RA, Jonathan LacГґte, Ambassador Extraordinary and Plenipotentiary of France to the RA, Harutyun Marutyan, AGMI Director and Kamo Areyan, the deputy Mayor of Yerevan. The partner of AGMI Armen Baghdasaryan introduced to the guests the history of construction of the memorial complex and its symbolism. 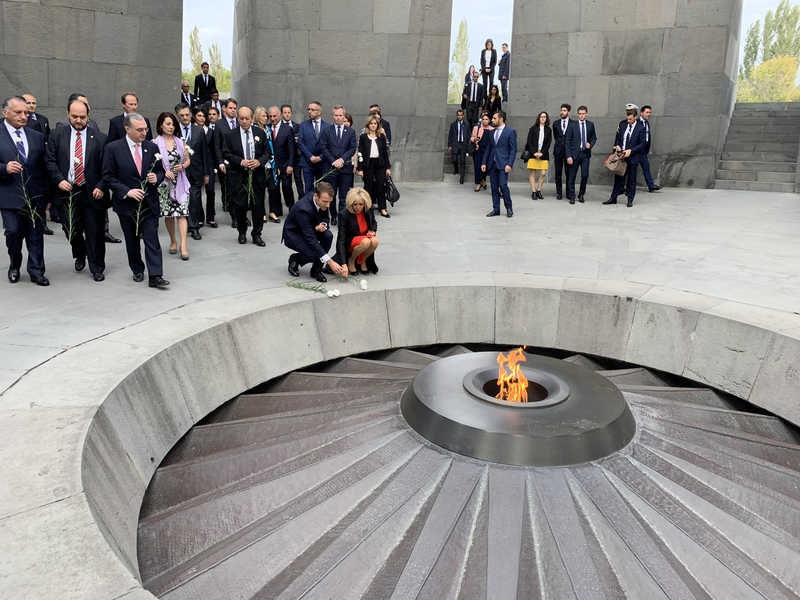 Emmanuel Macron laid a wreath at the Memorial, and with the members of delegation put flowers at the eternal fire honoring the memory of the innocent martyrs of the genocide. 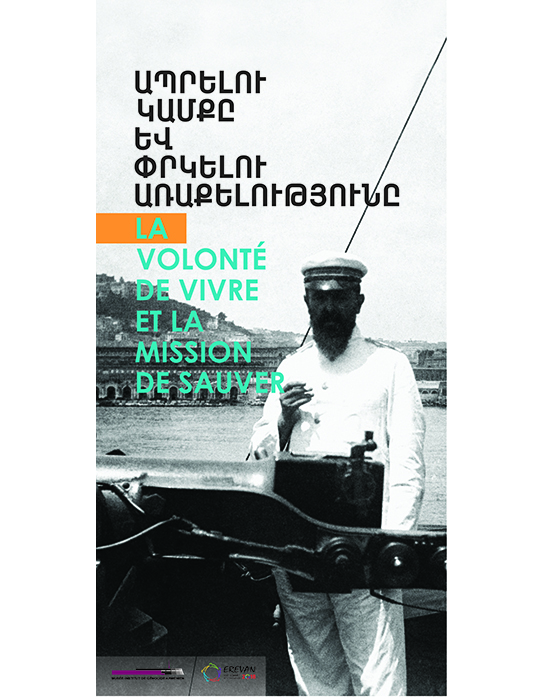 Today, in the framework of the XVII Francophone Summit in Yerevan, two new exhibitions - вЂњThe will to live and the mission to saveвЂќ and вЂњGrigor Chololian; the Armenian Photographer of ParisвЂќ - opened at the temporary exhibition hall of the Armenian Genocide Museum-Institute. 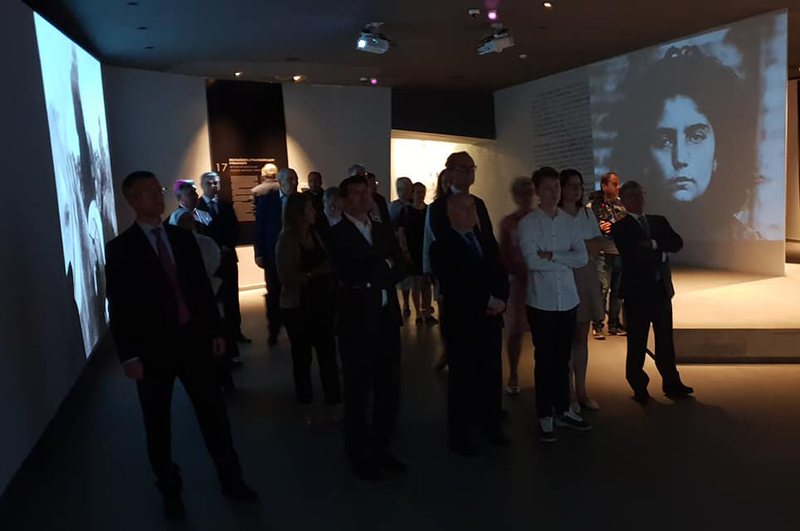 In the presence of numerous guests, media and French Ambassador to Armenia Jonathan LacГґt, the AGMI Director Harutyun Marutian inaugurated the temporary exhibitions. Patris Chololian, the son of Grigor Chololian, also attended the event, and presented his father's activities both in France and Istanbul. He thanked Mr. Hayk Demoyan for supporting the exhibition. 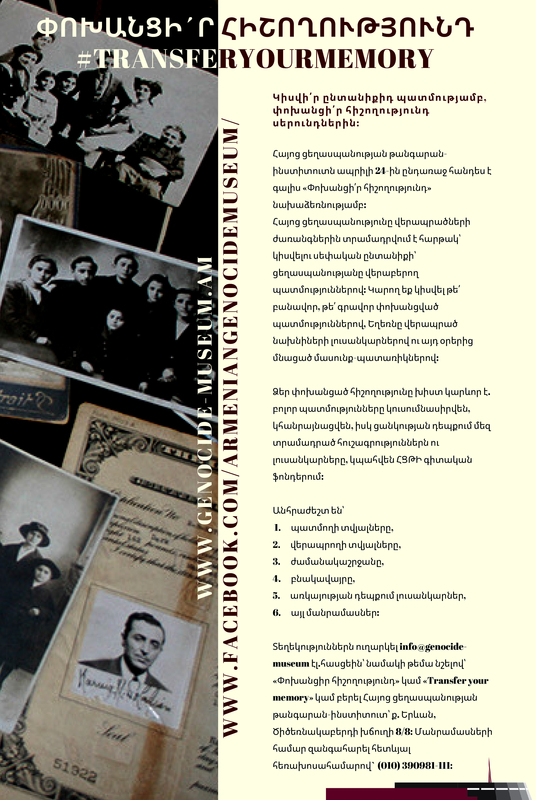 On October 10, at 12:00 an exhibition will be opened at the Armenian Genocide Museum-InstituteвЂ™s temporary exhibition hall. 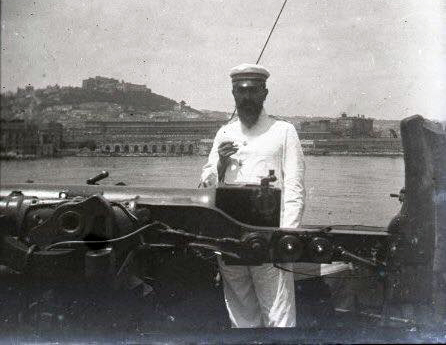 On the occasion of the XVII Francophone Summit to be held in Yerevan, the Armenian Genocide Museum-Institute has organized a temporary exhibition around newly discovered photos of the evacuation of the participants of Musa Dagh Battle by the French navy. 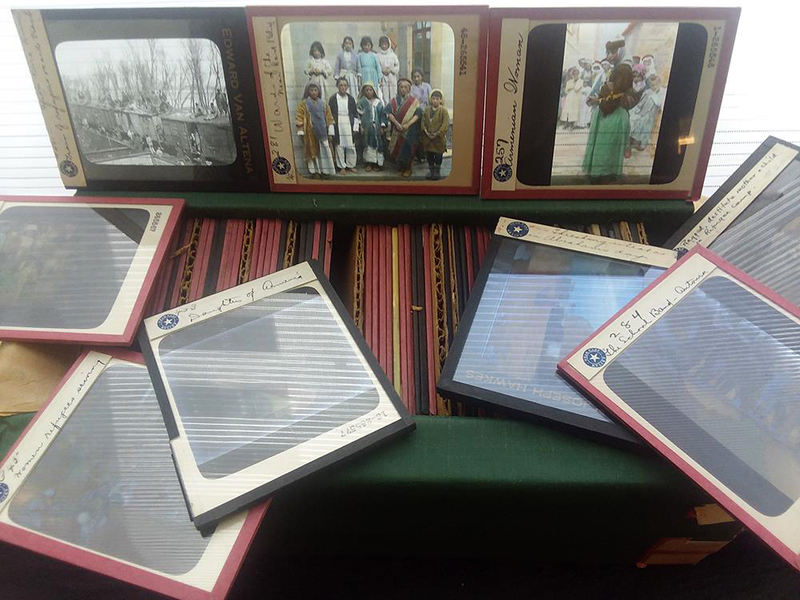 The glass negatives of these unique and valuable photos have been handed over to the Armenian Genocide Museum-Institute by An Soupan, a granddaughter of Lucien BeaujГ©, who was a lieutenant at the French Navy cruiser "Gishen". In September 1915, Lucien BeaujГ© became not only a participant of rescue operations, but also recorded with his camera this great episode in the history of humanity and mankind. 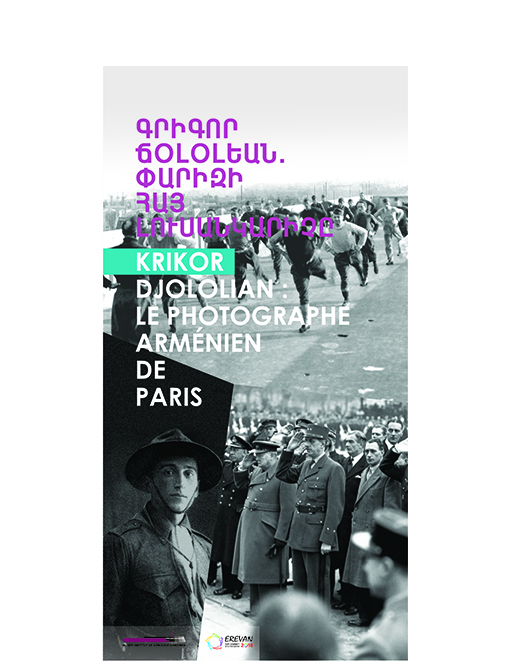 In the framework of the XVII Francophone Summit the Armenian Genocide Museum-Institute has organized a temporary exhibition of rare and unpublished photos of Krikor Jololian, a French-Armenian photographer, depicting 1930вЂ™s and 1940вЂ™s Parisian reality, unique episodes of the French-Armenian community and the liberation of Paris. Photo cameras will also be presented. From the orphanages of Constantinople to the capital of France, from a promising athlete to a well-known photographer, this is an odyssey of the Armenian Genocide survivor, a life where many similar fates could be reflected. Jean Block, the President of the University of California (UCLA), academic scientist and biologist, along with Doctor Erik Israelyan, a well-known American-Armenian physician, Coordinator at the David Geffen School of Medicine at UCLA, producer of the movie "The Promise," visited The Armenian Genocide Memorial Complex. The guests arrived in Armenia on the invitation of the President of The Republic Armenia Armen Sargsyan. Doctor Erik Israelyan and Jean Block were accompanied by Harutyun Marutyan, the Director of the Armenian Genocide Museum-Institute, who presented the history of construction of the memorial complex and its symbolism. The guests put flowers at the eternal fire honoring the memory of the innocent martyrs of the genocide and then made a tour in the Alley of Memory, where Mr. Israelyan and Mr. Block watered the tree planted by the creative team of the movie "The Promise" in 2017 in commemoration of Kirk Kerkorian, national hero of Armenia and a distinguished benefactor, thus retaining the promise never to forget the Armenian Genocide. 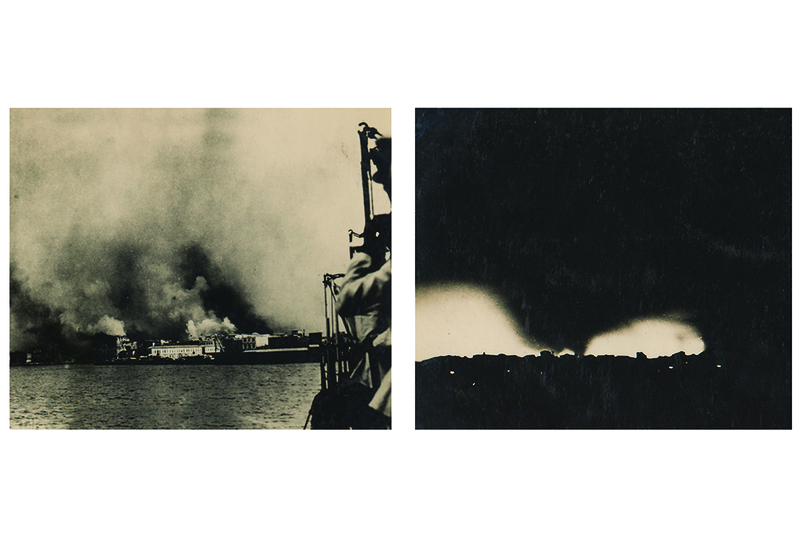 The photo presents panorama of Smyrna during the Great fire of 1922, September 13 - 22. Smyrna known among the Turks as вЂњGiavur IzmirвЂќ (infidel Izmir) turned into ashes and ruins in a few days. Dozens of Christian temples and institutions, the Greek and Armenian districts with their beautiful buildings were destroyed. Massacres of Christians began on September 9, after the KemalistsвЂ™ army entered Smyrna. The Kemalists who sought to establish a new state on the ruins of the Ottoman Empire intended to totally destroy the remnants of the Christian presence in the city and exclude their return even in case of peace. On September 13, a fire broke out in the Greek and Armenian districts of the city. It went on unhindered for a few days, accompanied with the slaughter of unarmed civilians: women, children and elderly. The survived Christians were forced to leave their native city forever. 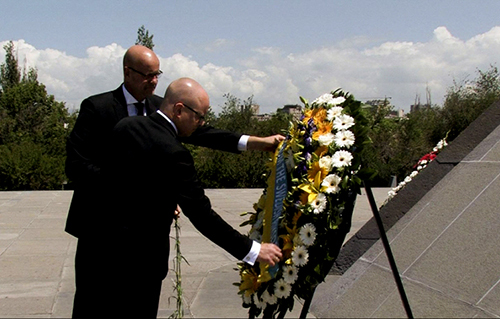 The ambassadors accredited in the Republic of Georgia visited the Armenian Genocide Memorial Complex. The members of the diplomatic delegation put flowers at the eternal fire honoring the memory of the innocent martyrs of the genocide. The guests were accompanied by the deputy director of the museum Lusine Abrahamyan, who also introduced the history of construction of the memorial complex and its symbolism. The members of the delegation also had a guided tour in the Museum, got acquainted with the museum exhibits, and at the end of the tour the guests left a note in the Memory Book. On September 14, Dr. Harutyun Tirani Marutyan, by secret ballot, was elected a as new director of AGMI during the meeting of the Board of Trustees of the Armenian Genocide Museum вЂ“ InstituteвЂќ foundation. Thirteen members of the Board of Trustees, headed by the president of AGMI board Dr. Raymond KГ©vorkian, were present at the session. Issues related to the Fund's activities were also discussed during the closed meeting. 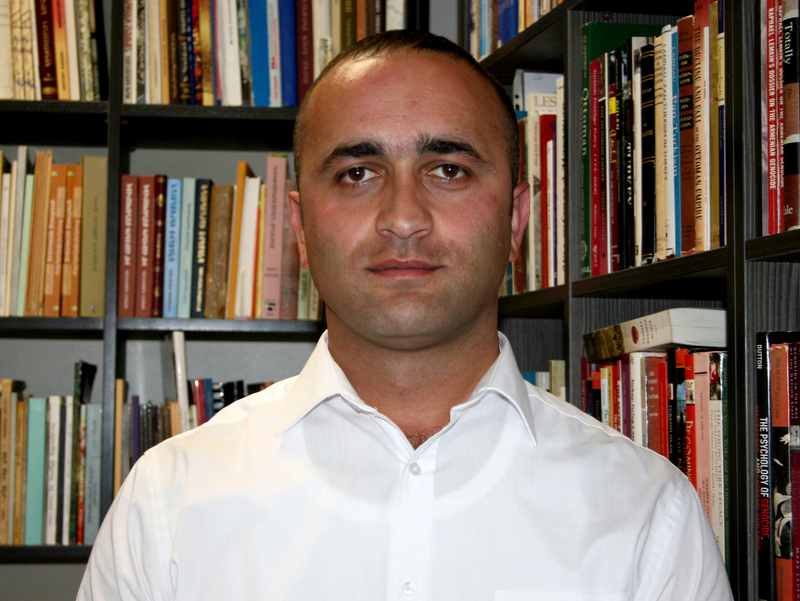 AGMI scholar Gevorg Vardanyan is admitted to the Department of History at North Carolina State University after a decade of research experience at the Armenian Genocide Museum-Institute. At NC State, his research focuses on Genocide memory and its representation. During his doctoral studies, he will also teach undergraduate students at NC State and will have extensive experience in various American museums. Previously, he has held various positions at the AGMI, such as a researcher, a senior researcher, a head of the Department of Comparative Genocide Studies, and a Scientific Secretary. 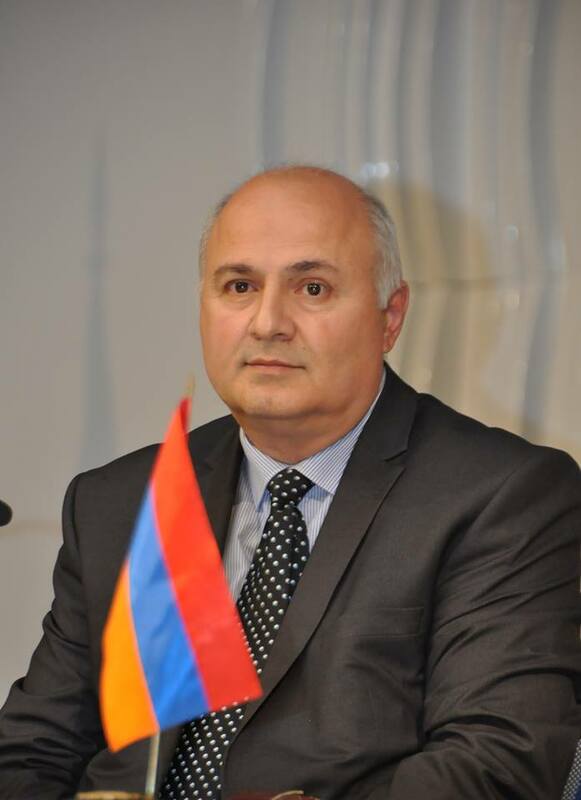 In 2017, he was appointed as the Acting Director of the AGMI with a decree of the Prime-Minister of Armenia and served until joining the NC State in 2018. On September 10, within the state visit to Armenia Mamouka Bakxtadze, the Prime Minister of Georgia, accompanied by Zohrab Mnacakanyan, the Minister of foreign affairs of the RA, and Kamo Areyan, the Acting Mayor of Yerevan, visited Tsitsernakaberd and paid tribute to the memory of the Armenian Genocide victims. 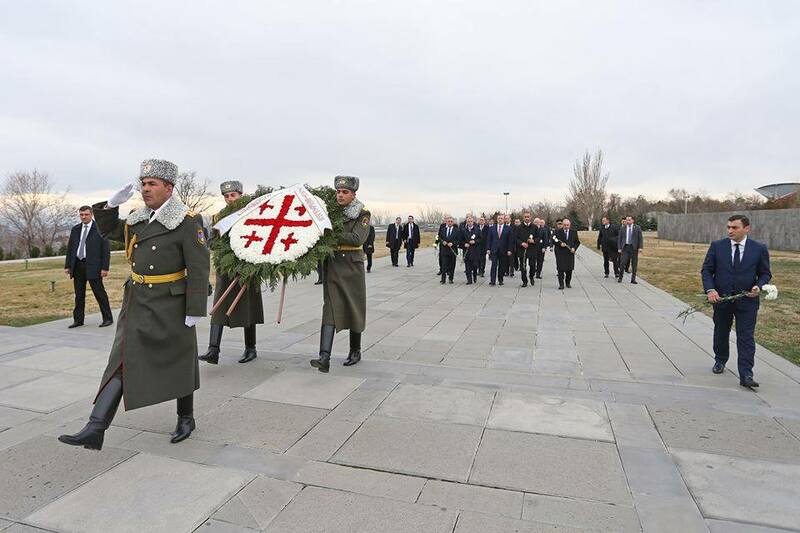 The Prime Minister of Georgia laid a wreath at the Memorial, and with the members of delegation put flowers at the eternal fire honoring the memory of the innocent martyrs of the genocide. The guests were welcomed by the AGMI acting director Narine Margaryan and AGMI Deputy Director Suren Manukyan, who introduced to the Prime Minister the history of construction of the memorial complex and its symbolism. Mamouka Kakxtadze also made a tour in the Memory Alley, where he planted a silver fir. 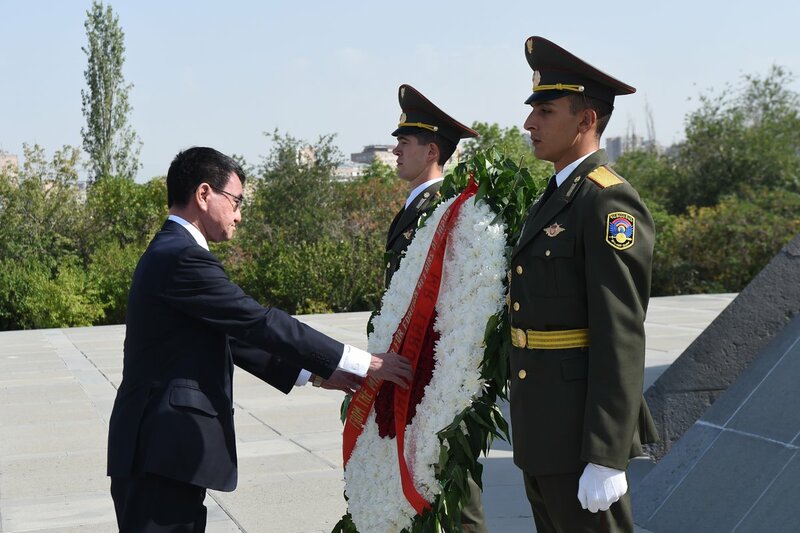 Within the state visit to Armenia, Taro Kono, the Minister of Foreign Affairs of Japan, visited the Armenian Genocide Memorial Complex, and paid tribute to the memory of the Armenian Genocide victims. 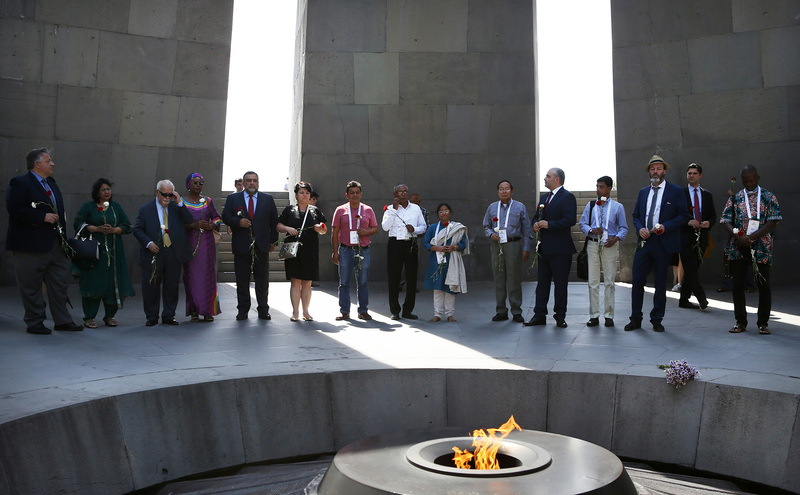 Taro Kono laid a wreath at the Memorial, and with the members of delegation put flowers at the eternal fire honoring the memory of the innocent martyrs of the genocide. The Minister was accompanied by Armen Papikyan, Deputy Minister of Foreign Affairs of the RA, and Hrant Poghosyan, the Ambassador of Armenia to Japan. Today an event of unique donation took place at the conference hall of the Armenian Genocide Museum-Institute. Syrian-Armenian repatriated George Barseghyan donated a family relic to the museum - a gun used during the Battle of Aintab. George Barseghyan, a doctor by profession, has been living in Armenia for six years already. 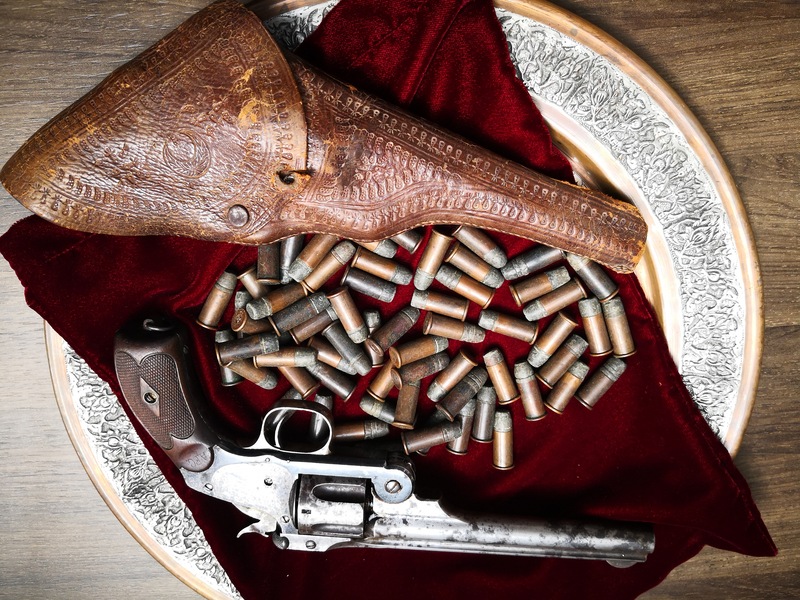 Being in touch with homeland, he has firmly decided to give his family relic-gun which was transferred from generation to generation to the Armenian Genocide Museum-Institute. вЂњThis is the place of its final and permanent location - a sanctuary dedicated to the memory of one and a half million victims - where it is as close as possible to the souls of the martyrs вЂњ вЂ“ said Mr. Barseghyan. 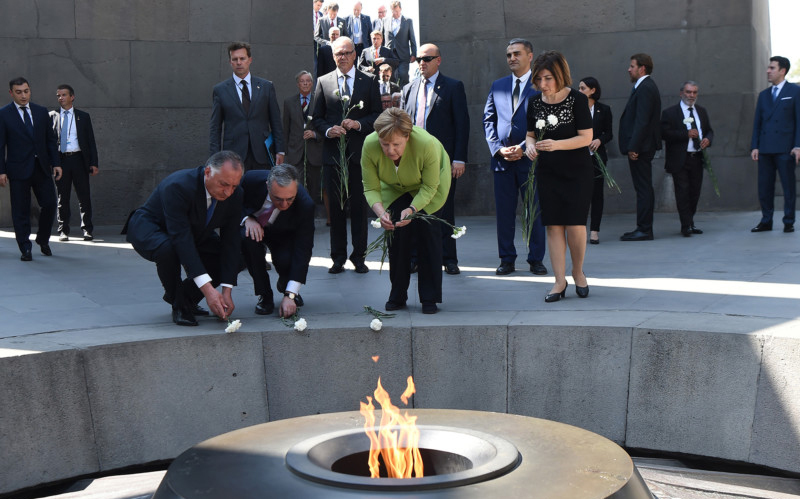 Within the state visit to Armenia Angela Merkel, the Chancellor of the Federal Republic of Germany, paid tribute to the memory of the Armenian Genocide victims in Tsitsernakaberd. Angela Merkel was accompanied by the RA Foreign Minister Zohrap Mnacakanyan, Yerevan Acting Mayor Kamo Areyan, AGMI Acting Director Narine Margaryan, and AGMI Deputy Director Suren Manukyan, who introduced to the Chancellor the history of construction of the memorial complex and its symbolism. 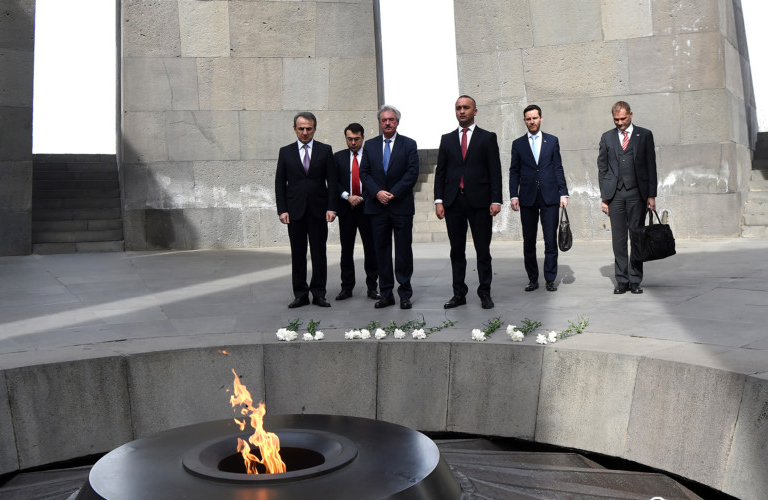 The Chancellor of the Federal Republic of Germany laid a wreath at the Memorial, and the members of delegation put flowers at the eternal fire honoring the memory of the innocent martyrs of the genocide. 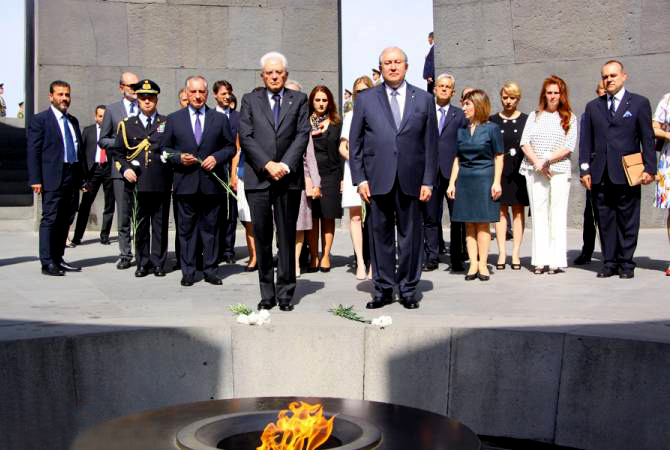 Within the framework of the state visit to Armenia Sergio Mattarella, the President of the Republic of Italy, with Armen Sarkissian, the President of the Republic of Armenia, visited the Armenian Genocide Memorial. 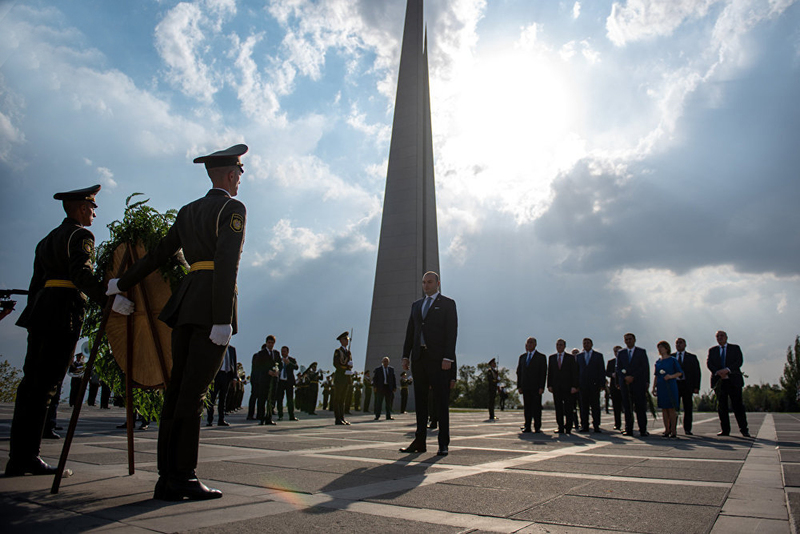 The presidents of two countries laid wreaths at the Monument, and with the members of the official delegation put flowers at the eternal fire, honoring the memory of the innocent martyrs with a minute of silence. Two presidents were accompanied by Mrs. Mattarella and Mrs. Sarkissian. The high ranking guests were welcomed by Narine Margaryan, AGMI Acting Director. 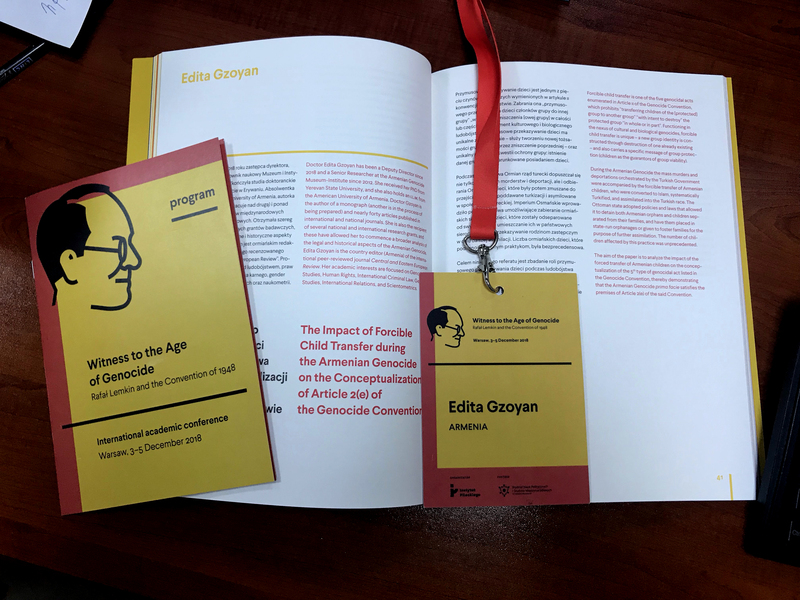 Edita Gzoyan, a senior researcher of the Armenian Genocide Museum-Institute, participated at the international scientific forum вЂњRemembering the Democratic Republic of Georgia 100 years on: a Model for Europe?вЂќ held on June 25-30 in Tbilisi, Georgia. 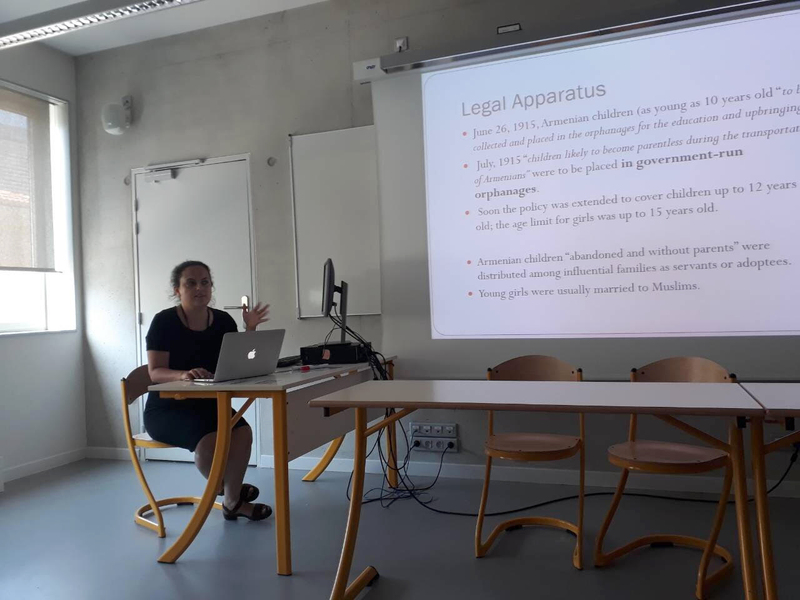 On July 4-7, Edita Gzoyan participated at the 6th global conference of the Network of Genocide Scholars вЂњGenocide and Mass Violence: diagnosis, treatment, and recovery? Humanities, social and medical sciences facing extreme violenceвЂќ held at the Medical Faculty of Aix-Marseille University (France). Nearly 100 participants from all over the world attended the conference. 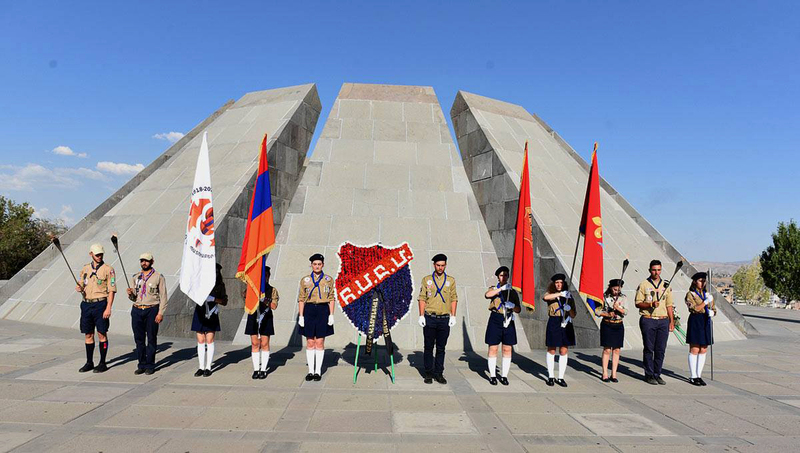 On July 20, the solemn ceremony to launch celebrations dedicated to the centennial of the Homenetmen-Armenian General Athletic Union Scouts was held in Tsitsernakaberd, Armenian Genocide Memorial. On this occasion, the exhibition titled вЂњArmenian Sport and Athletics in the Ottoman EmpireвЂќ was reopened at the Armenian Genocide Museum-Institute. The historical event was attended by Garnik Mkrtichyan, a Homenetmen Central Board Chairman, Dr. Narine Margaryan, an Acting Director of the Armenian Genocide Museum-Institute, Dr. Hayk Demoyan, high-ranking guests, former and new Homenetmen members. First, the ceremony of raising the flag of the Armenian General Athletic Union took place accompanied by the Homenetmen Orchestra. This was followed by the speeches of Dr. Hayk Demoyan and Garnik Mkrtichyan. Screening of вЂњTanielвЂќ movie took place on 17 July, at 13:00 at the conference hall of the Armenian Genocide Museum-Institute. Narine Margarian, the Acting Director of the AGMI welcomed the guests and presented Taniel VaroujanвЂ™s biography. "Taniel" is a film noir. In Western Armenian and English languages it describes the story of the arrest and murder of the Western Armenian poet Varoujan in 1915. The film is beautifully narrated with VaroujanвЂ™s poetry. The screening was attended by the creative team, headed by British-Armenian director Garo Berberian. The movie director thanked the Armenian Genocide Museum-Institute for hospitality and support. The screening of the movie was followed by the question and answer session, and then the audience had the opportunity to listen more of Varoujan's poetry and learn more about his life. The Armenian Genocide Museum-Institute will be closed on July 5th, 2018. This unique collection of over 70 original photos is so far the biggest to replenish the AGMI collection. вЂњThis is the best achievement of the last ten years of my collective work, these are fantastic photos, well-known and unknown, and we can get great and high quality print versions of these photos for the exhibition of the Armenian Genocide Museum. I have purchased them in the US during my business trip, after nearly two years of negotiations, the owner of the collection agreed to donate it to the museumвЂќ вЂ“ mentions Hayk Demoyan, Doctor of Historical Sciences and Genocide Expert. The uniqueness of the photos is that most of them are colorful, and so far depict the unknown scenes of the consequences of the genocide, group photographs of survivors and orphans, scenes of transfer of refugees-survivors, etc. 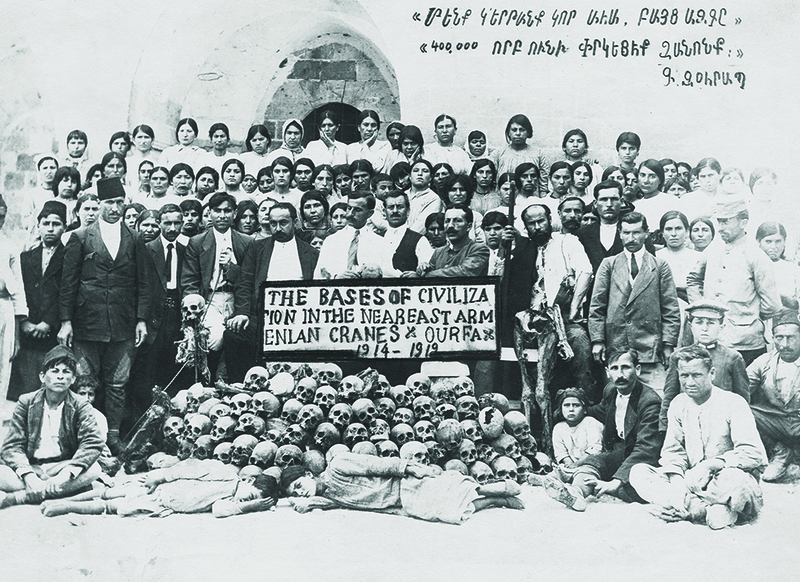 After the ceasefire of 1918, about 4500 Armenian survivors of genocide gathered in Urfa, which included a large number of Armenians who survived the massacre in the homeland after the Battle of Urfa and other Armenian-populated areas of the Ottoman Empire. In order to coordinate the problems of survivors of the massacres, the Armenian National Union branch was formed, which, among other things, also undertook the collection of cinders of Armenians from UrfaвЂ™s destroyed houses, which was a result of self-defense. AGMI senior researcher Edita Gzoyan participated in the conference "The Lessons of the Republic of Armenia 1918-1920 in the context of generations' memory and modernity challenges" held at the American University of Armenia in May 31 - June 1 and organized by the VEM pan-Armenian journal. 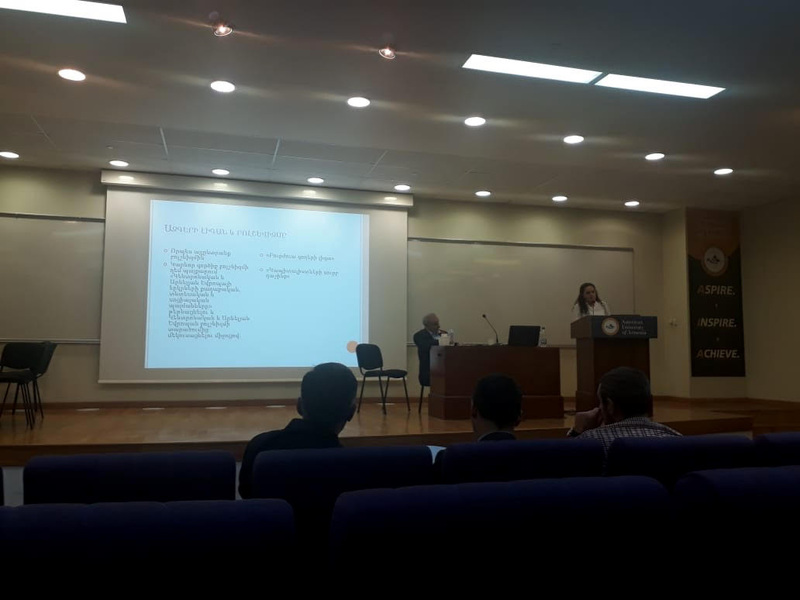 Dr. Edita Gzoyan presented a speech titled "The international legal status of the Republic of Armenia according to the League of Nations' archival documents". The reporter presented the legal status of the Republic of Armenia in the context of admitting the newly established republic to the League of Nations, assessed the role of the Treaty of Sevres, while making parallels with the other newly established republics on the territory of the former Russian Empire. On June 7, co-founders of Aurora Humanitarian Initiative Ruben Vardanyan, Nubar Afeyan, Vardan Gregoryan visited the Armenian Genocide Memorial and Museum with the 2018 Aurora Prize nominees. The guests put flowers at the eternal fire, honoring the memory of the innocent martyrs of the genocide accompanied by Hayk Demoyan. 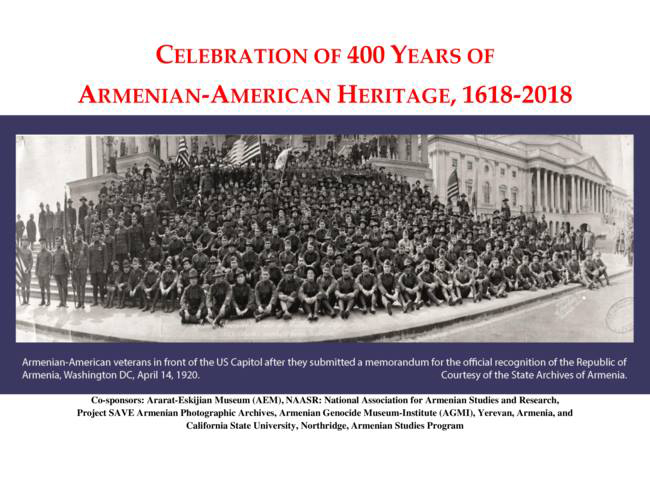 During the meeting at the conference hall of AGMI, Doctor of Historical Sciences Hayk Demoyan introduced his new monograph titled вЂњArmenian Legacy in America: A 400-year HeritageвЂќ. 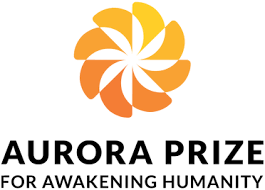 The book was published through the generous support of the вЂњNoubar and Anna AfeyanвЂќ foundation, on behalf of the Aurora Humanitarian Initiatives. 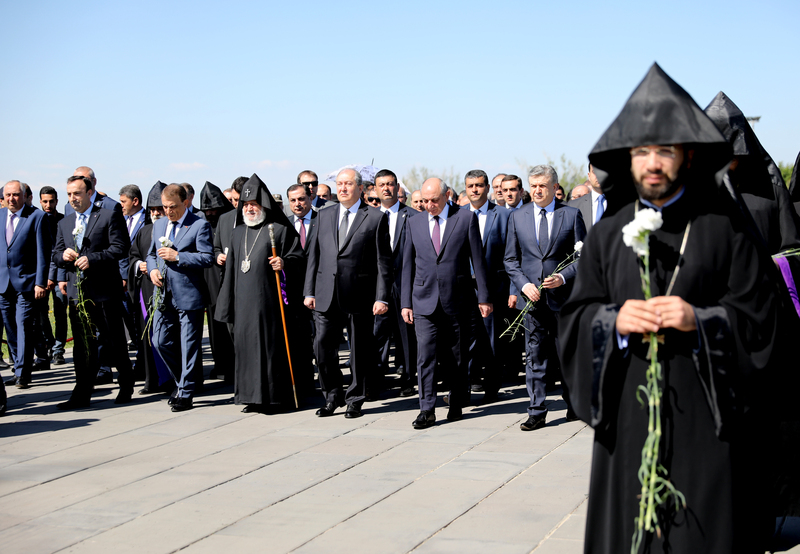 On May 19, the Pontian Greek Genocide Remembrance Day, Eduard Sharmazanov, Vice President of the RA National Assembly, Deputies of the RA National Assembly, representatives of the Greek Embassy in Armenia, the Armenian community of Greece and the clergy visited the Armenian Genocide memorial Complex. The guests were welcomed by Gevorg Vardanyan, AGMI Acting Director, and introduced to the history of construction of the memorial complex and its symbolism. The members of delegation laid a wreath at the eternal fire, honoring the memory of the innocent martyrs of the genocide committed by Ottoman Turkey against Pontic Greeks of Asia Minor in 1915-1923 with a minute of silence. Archbishop Yeznik Petrosyan held a requiem service for the peace of innocent victims. 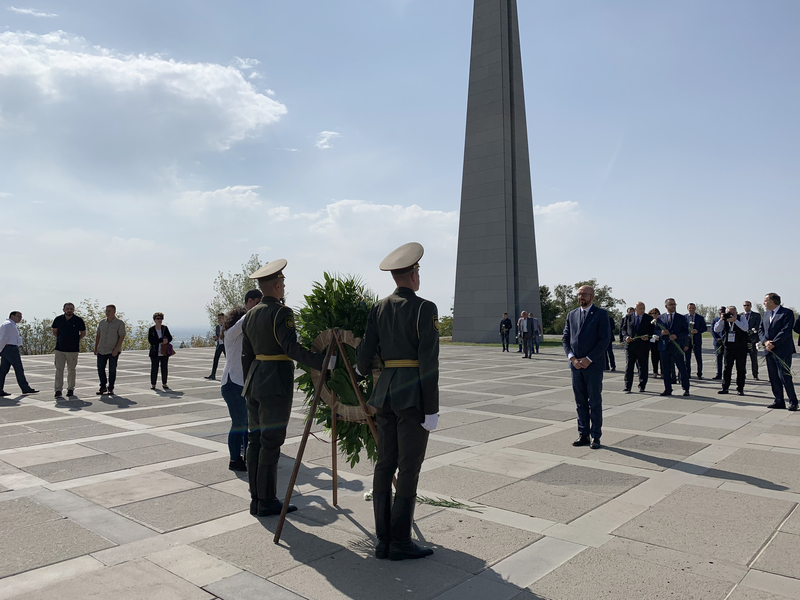 On May 16, delegation headed by BjГ¶rn SГ¶der, Deputy Speaker of the Parliament of Sweden, visited the Armenian Genocide Memorial Complex accompanied by Eduard Sharmazanov, Deputy Speaker of the RA National Assembly. The guests were welcomed by Gevorg Vardanyan, AGMI Acting Director, and introduced to the history of construction of the memorial complex, and its symbolism. 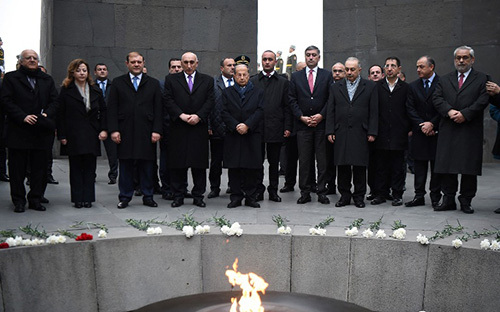 The members of the delegation laid a wreath at the Monument, and put flowers at the eternal fire, honoring the memory of the innocent martyrs with a minute of silence. The Armenian Genocide Museum-Institute will be closed on May 9th, 2018. 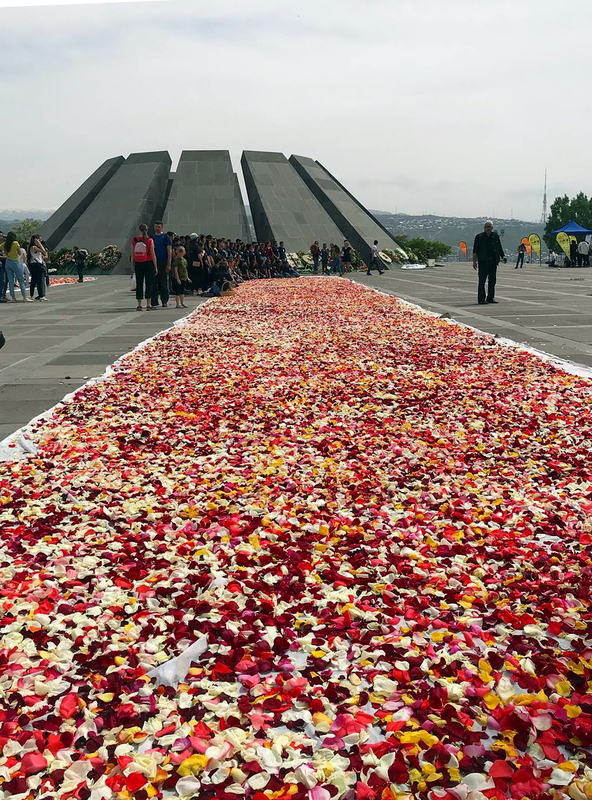 Today the annual flower collecting event took place at the Armenian Genocide Memorial Complex. Humbled flowers at the eternal fire, put on April 24, were collected to be given a second life. 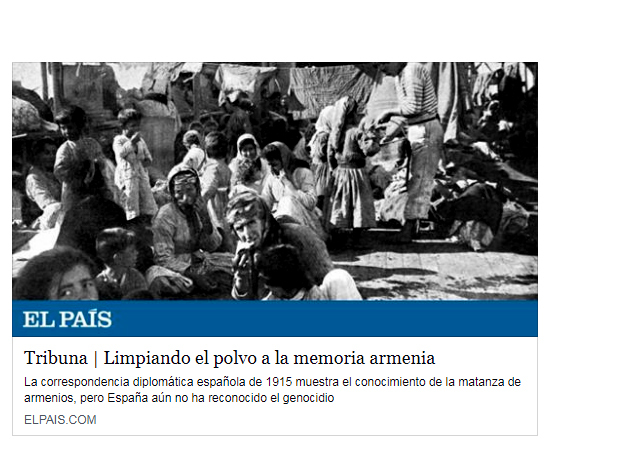 The article titled вЂњCleaning the dust of the Armenian MemoryвЂќ is about the Spanish historic archives regarding the Armenian Genocide. Spain preserves dozens of letters, telegrams and press notes talking about the massacres from 1915 with the radicalization of Young Turks, the Provisional Law and the mass murder crimes. The Spanish embassies and consulates in the Ottoman Empire (Constantinople, Jerusalem, and Damascus) informed the Spanish Crown and Government about the extermination of Armenian people. 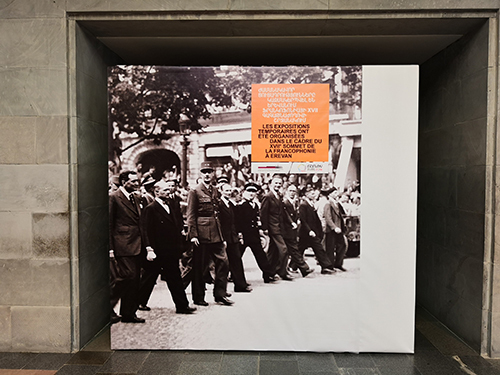 Today the opening of the exhibition titled "Birth of the Republic" dedicated to the 100th anniversary of the First Republic of Armenia took place at the Temporary Exhibitions Hall of the Armenian Genocide Museum-Institute for the representatives of mass media. 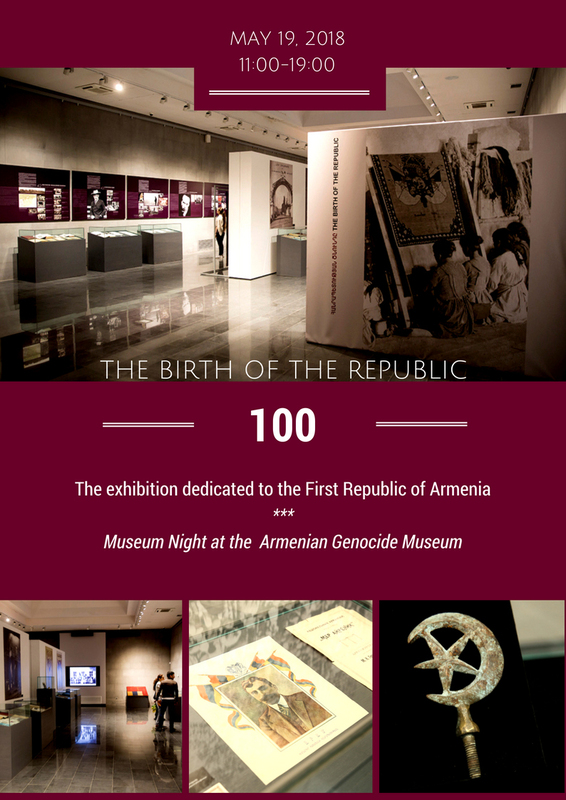 The exhibition includes unique exhibits relating to the First Republic of Armenia from a number of Armenian and Diaspora museums and personal collections. Among the rare exhibits are posters, medals, jubilee postcards, unique editions, historical photographs, etc. Also a flagpole of a Turkish flag found in Sardarapat, Avetis Aharonyan's golden pen, by which the Treaty of Sevres was signed, exclusive exhibits about the Armenian army and state symbols are presented. In mid-July the Turkish gendarme detachments met the grave resistance of Armenian population. 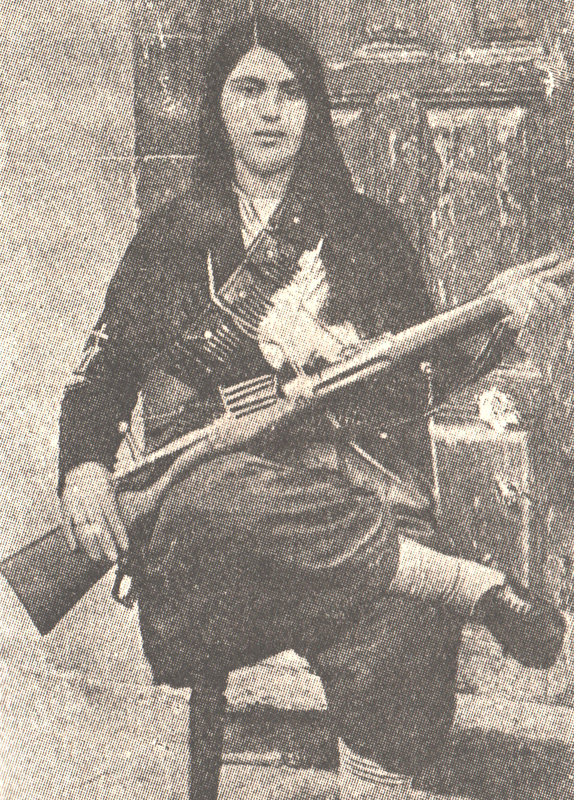 A few days later a regular army consisting of 8000 Turks and Muslim mobs was drawn against Armenian forces (about 600 fighters, including women). 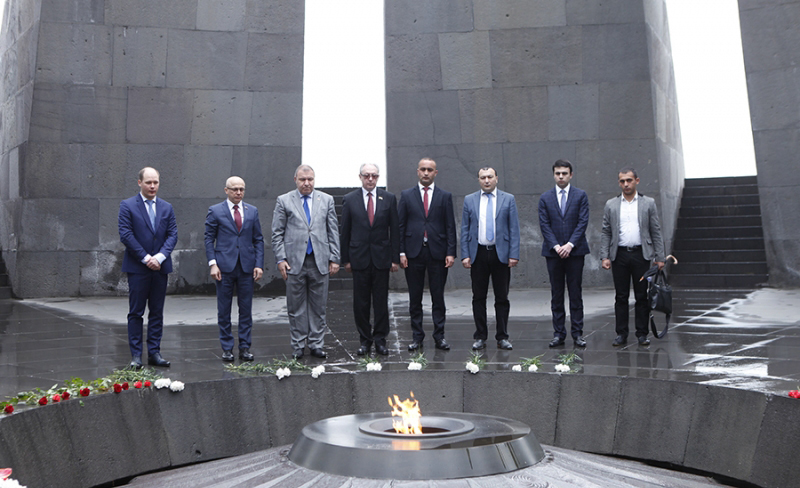 Delegation led by Elissan Shandalovich, President of the Legislative Assembly of the Republic of Karelia (RF), accompanied by Mikael Melkumyan, Deputy Speaker of the RA National Assembly, and Vahe Enfiadjyan, member of the RA National Assembly, visited the Armenian Genocide Memorial Complex. The members of delegation put flowers at the eternal fire, by honoring the memory of the innocent martyrs with a minute of silence. Corinna Shattuck was born on April 21, 1848, in the city of Lyuisville, Kentucky, USA. After her parentsвЂ™ death, she moved to Acton, Massachusetts to her grandparents, where she spent her childhood. She studied pedagogy at Framingham normal school (now Framingham State University). 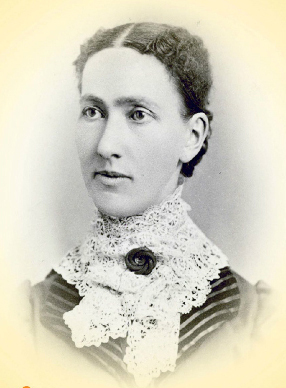 In the fall of 1873, as a missionary of the American Board of Commissioners for Foreign Missions she left for Aintab. From 1873 she helped Armenians of Aintab, Urfa, Marash, Adana and Kessab. In 1892, she finally settled in Urfa and took the management of the missionary work there. By threatening her own life she sheltered and saved the lives of 240 Armenians in her home (60 men, the rest - women and children) during 1895 Urfa massacre. She did not use her right to move to Aintab, preferring to help the Armenians from the massacres. The missionary did not spare any effort to care for orphans, feed the homeless, and heal the cuts of the wounded. 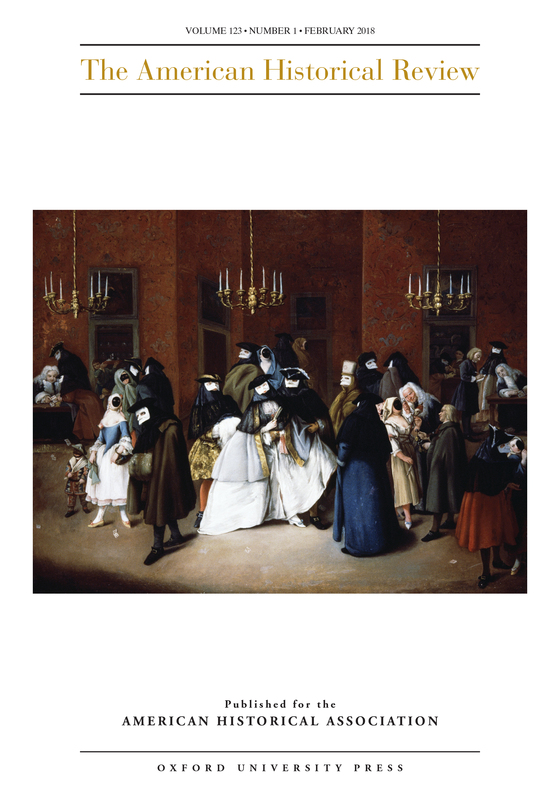 She established an Orphanage in the Protestant School, and soon the number of children in that orphanage reached 300. Avetis Sanosyanm, one of the inmates of the orphanage wrote; вЂњThis noble missionary tried in every way to be useful to the people, if someone needed clothes, she had to find a mean to provide him/her with home and meal. If the orphans had to gather upon one shelter, then they should be educated. The photograph depicts starving Armenian orphans in tatters, standing in the snow in cold winter and waiting for their turn to enter the American Near East Relief orphanage. This was possible only if one of the children in the orphanage died to free a place for another orphan. Armenian Genocide resulted in death of tens of thousands of Armenian children; those who survived became orphans, deprived of parental care. In order to provide livelihood to those children and save them from inevitable death, an unprecedented in the history of mankind rescue mission was launched wherein the American Near East Relief Committee played a major role. The organization carried out a vigorous activity in Syria, Lebanon, Greece and Armenia, and after the Armistice of Mudros, the organization led relief activities also in the inner regions of the Ottoman Empire. 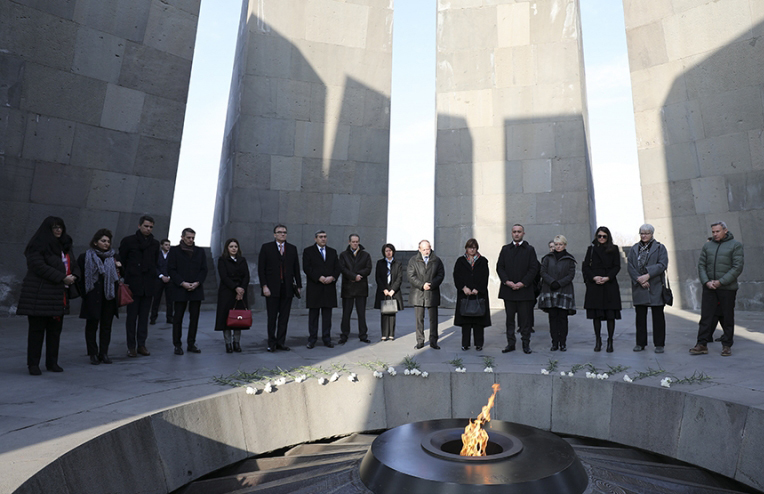 The French delegation led by Jean-Baptiste Lemoyne, the minister of state attached to the Minister for Europe and Foreign Affairs, visited the Armenian Genocide Memorial Complex and paid tribute to the memory of the Armenian Genocide victims. The guests were welcomed by Gevorg Vardanyan, the AGMI Acting Director, who introduced to the history of construction of the memorial complex and its symbolism. Jean-Baptiste Lemoyne laid a wreath at the Monument, and the members of delegation put flowers at the eternal fire, honoring the memory of the innocent martyrs with a minute of silence. 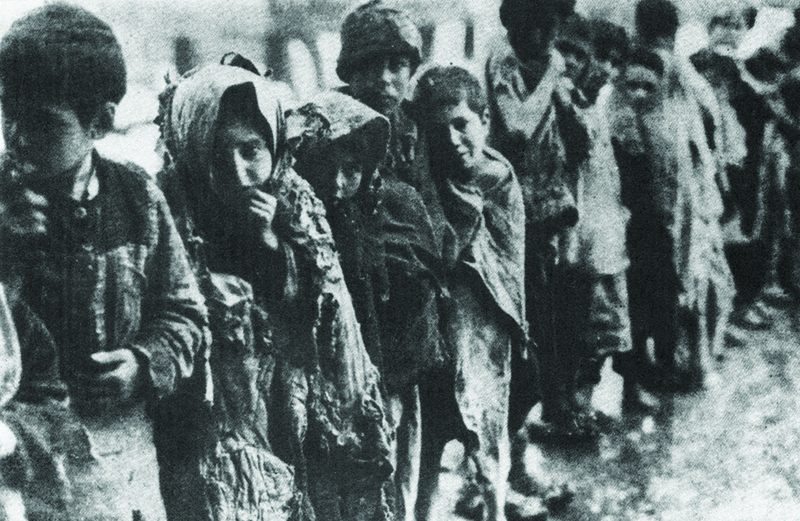 The policy of turkification and assimilation of children during the Armenian genocide was an important component of the Ottoman genocidal policy. The Ottoman documents clearly show that the Turkish government aimed at systematically assimilating the Armenian children. The process of Islamization of children and erasure of their national and religious identity was easier to implement at an early age. 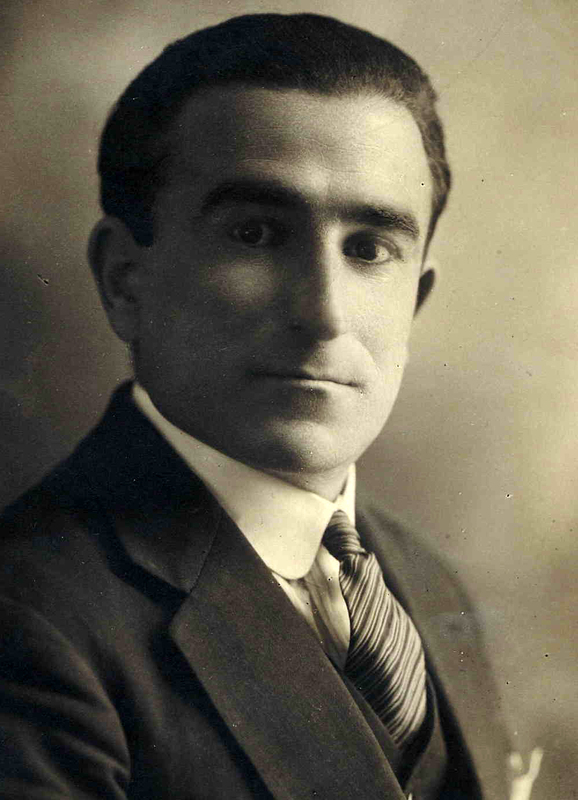 Famous genocide scholar Vahagn Dadryan referring to the issues of forced Islamization of Armenian children during the Armenian Genocide, notes that вЂњthe Ottoman Turks were quite appreciative of the value of the gene pool that Armenian children embodied; they were regarded as an invaluable resource for the enrichment of the mainstream of the Turkish nationвЂќ. Forcible Islamization of Armenian children was implemented on two levels: by the state and public masses. 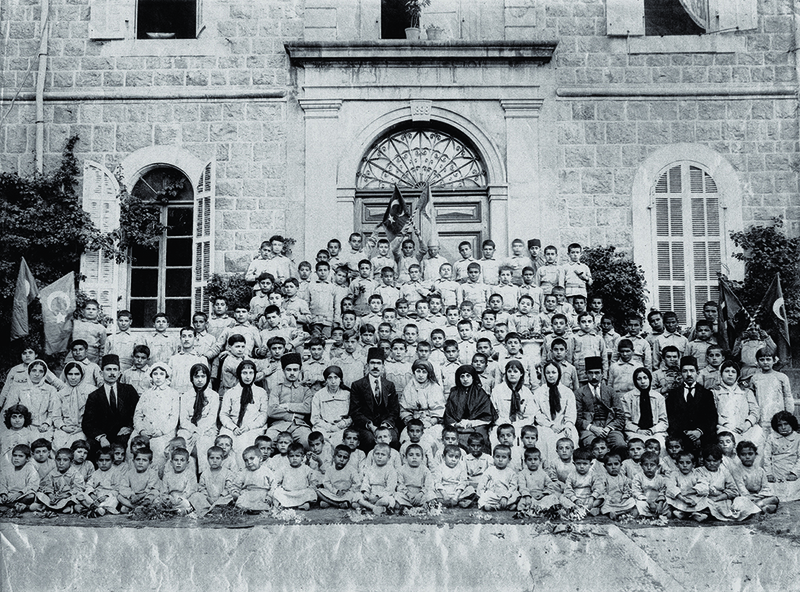 Many Armenian children were kidnapped by Turks and Kurds, sometimes they were вЂњadoptedвЂќ, and living in an Islamic environment, they were gradually turkifyied and assimilated to that society. Jean Asselborn, the minister of Foreign and European Affairs of Luxemburg, visited the Armenian Genocide Memorial and paid tribute to the memory of victims of the Armenian Genocide. The guests were welcomed by the AGMI Acting Director Gevorg Vardanyan and introduced to the history of construction of the memorial complex and its symbolism. Minister Asselborn put flowers at the eternal fire, by honoring the memory of the innocent martyrs with a minute of silence. The guests also visited the Memory Alley, where the Foreign Minister planted a nominal fir. 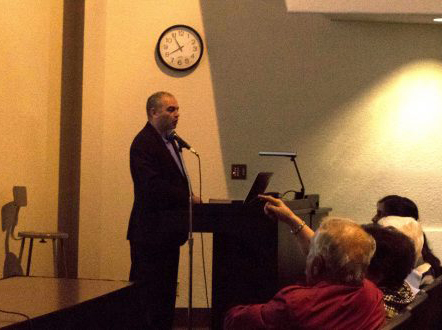 On March 19, Dr. Hayk Demoyan gave a lecture entitled вЂњMultiple Identities and Memories of the Armenian WorldвЂќ at Fresno StateвЂ™s University Business Center. The lecture, which was a part of the Armenian studies program spring lecture series, showcased the research of Hayk Demoyan. DemoyanвЂ™s lecture examined how physical symbols of Armenian history like monuments, statues and stamps vary throughout different countries. He explained that through the construction of these physical entities, some try to frame history the way they would like it to be framed. This can lead to differing narratives among people. An overarching theme of the lecture was that there are disputes regarding whether certain historical figures or events should be perceived positively or negatively. On March 24, the delegation of the RF Federal Assembly State Duma Committee for CIS Affairs, Eurasian Integration and Relations with Compatriots accompanied by the Chair of the RA NA Standing Committee on Foreign Relations Armen Ashotyan and AGMI Acting Director Gevorg Vardanyan visited Armenian Genocide Memorial Complex. 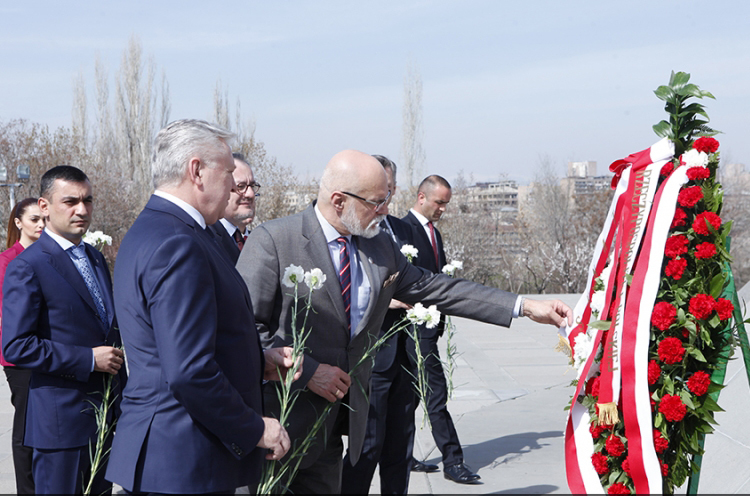 On behalf of the RF FA State Duma the members of the delegation laid a wreath at the Genocide Monument, and put flowers at the eternal fire, by honoring the memory of the innocent martyrs with a minute of silence. 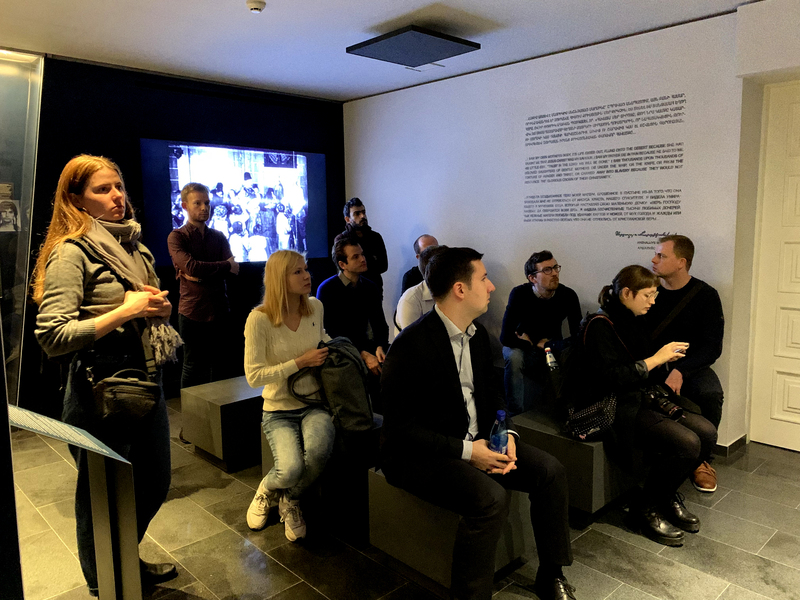 The guests also visited the Armenian Genocide Museum, observed the exhibits, got acquainted with the documents proving the Armenian Genocide and left a note in the Memory Book. The interview of Gevorg Vardanyan, acting director of the Armenian Genocide Museum-Institute, was published in the policy journal of the American Hellenic Institute. The interview of George Shirinian, the Executive Director of the International Institute for Genocide and Human Rights Studies (A Division of the Zoryan Institute), is devoted to the comparative studies of the Armenian Genocide, particularly the Greeks genocide. The American Hellenic Institute is one of the most influential Greek lobby organizations of USA. It was established in 1974, and has a great role in Greek-American relations, the Cyprus issue and the recognition of Greek genocide. The on-line magazine released by the Institute has a large audience among the Greeks in USA, as well as cultural, public and political figures. The delegation of the Political Affairs Committee of the Parliamentary Assembly of La Francophonie (APF) accompanied by the AGMI Acting Director Gevorg Vardanyan and the Head of the RA NA delegation to the Parliamentary Assembly of La Francophonie Margarit Yesayan visited the Armenian Genocide Memorial Complex. The President of the Political Affairs Committee of the Parliamentary Assembly of La Francophonie, the Member of the Senate of France Christophe-AndrГ© Frassa and the members of the delegation put flowers at the eternal fire, by honoring the memory of the innocent martyrs with a minute of silence. The members of the delegation also visited the Armenian Genocide Museum, were introduced with the museum exhibits, documentary proofs and photos about the Armenian Genocide and left a note in the Memory Book. On March 18, the delegation of the Foreign and European Union Affairs Committee of the Senate of the Republic of Poland accompanied by the Head of the RA NA Armenia-Poland Friendship Group Vahan Harutyunyan, Shirak Torosyan, the member of the RA NA Standing Committee on Foreign Relations and PaweЕ‚ Cieplak, the Ambassador Extraordinary and Plenipotentiary of Poland to Armenia visited the Armenian Genocide Memorial Complex. 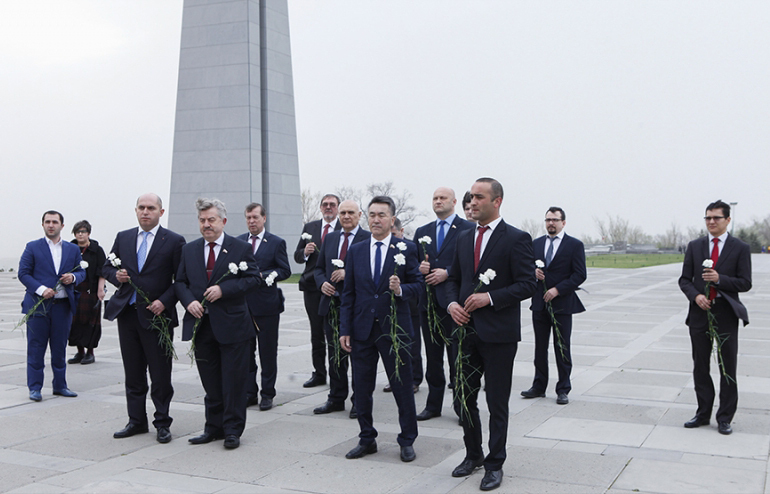 The Chairman of the Foreign and European Union Affairs Committee of the Senate of the Republic of Poland Marek Rocki and the members of the delegation laid a wreath and flowers at the Armenian Genocide Memorial Complex and at eternal fire honoring the memory of the innocent martyrs with a minute of silence. The major flow of Armenian emigration to the United States from both Western and Eastern Armenia started in the second half of the 19th century. Primarily, these individuals were medical or theological students. Until the late 19th century, there were few cases of these immigrants seeking a permanent settlement in the U.S. Armenian men, who were the first sojourners arriving in the United States as working migrants, usually had their families behind and their primary goal was to accumulate funds before returning to their homeland and rejoining their families. 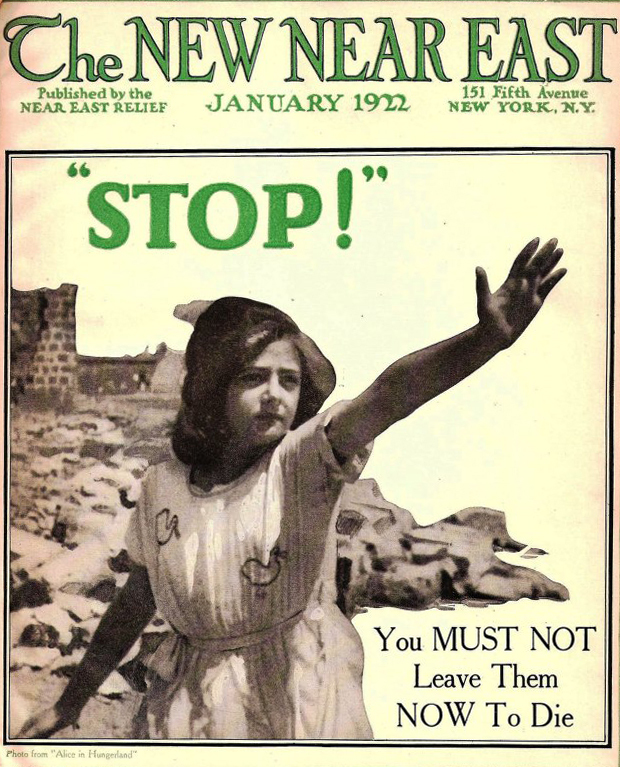 Armenian-American publications and local memorabilia from this time contain instructions on how one should behave in the U.S. and keep loved ones вЂњback homeвЂќ foremost in their minds. The Hamidian massacres of 1894-1896 triggered a fresh wave of Armenian migration from the Ottoman Empire and forced many of those already in the U.S. to face a very personal dilemma: stay in the new land and cut off family connections back home or attempt, by all means possible, to bring family members to the U.S. The Armenian Genocide Museum-Institute (AGMI) together with Ararat-Eskijian Museum (AEM), National Association for Armenian Studies and Research (NAASR), Project SAVE Armenia photograph Archives and Armenian Studies program at California State University Northridge are organizing a conference dedicated to the 400th anniversary of the arrival of the first Armenian to America вЂњMartin the ArmenianвЂќ (Virginia 1618) on March 16-17, in Ararat House in Los Angeles, George Deukmejian Community Center. The conference titled вЂњCelebration of 400 years of Armenian-American heritage, 1918-2018вЂќ will focus on the history of the Armenian-American community and its remarkable achievements that were very modest at the start. Doctor of Historical Sciences Hayk Demoyan, who is also a major supporter of the conference and exhibition, will participate at the event. The Armenian Genocide Museum-Institute will be closed on March 8th, 2018. Delegation led by Prime Minister of Georgia Giorgi Kvirikashvili, who has arrived in Armenia on an official visit, visited the Armenian Genocide Memorial Complex and Museum accompanied by Vahan Martirosyan, RA Minister of Transport, Communication and Information Technologies, and Kamo Areyan, Deputy Mayor of Yerevan. 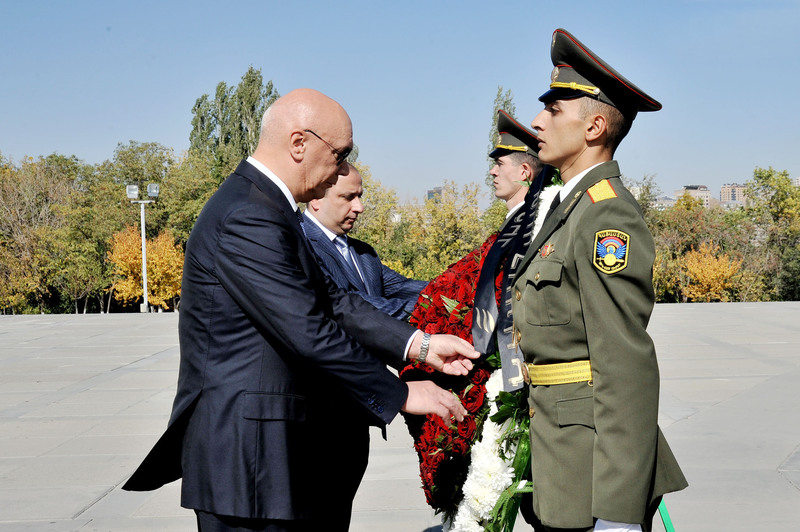 The high-ranking guests were welcomed by the AGMI Acting Director Gevorg Vardanyan and introduced to the history of construction of the memorial complex and its symbolism. 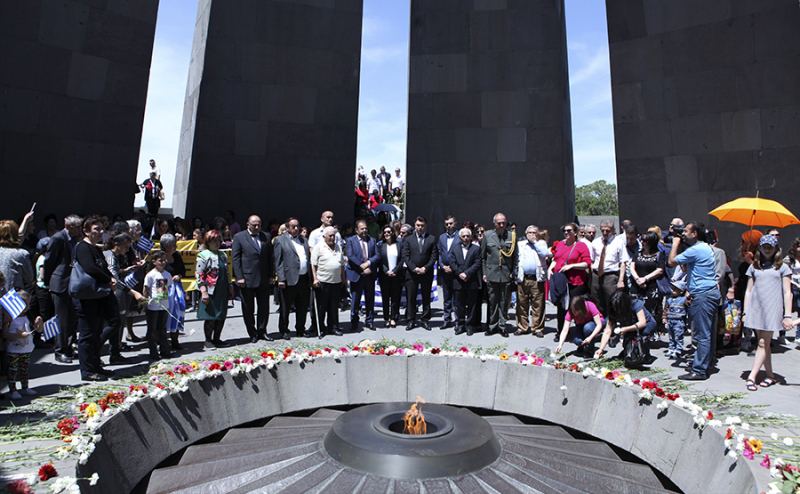 Prime Minister of Georgia Giorgi Kvirikashvili laid a wreath at the Monument, and the members of delegation put flowers at the eternal fire, honoring the memory of the innocent martyrs with a minute of silence. Prime Minister also watered the fir he planted in Memory alley in 2016. 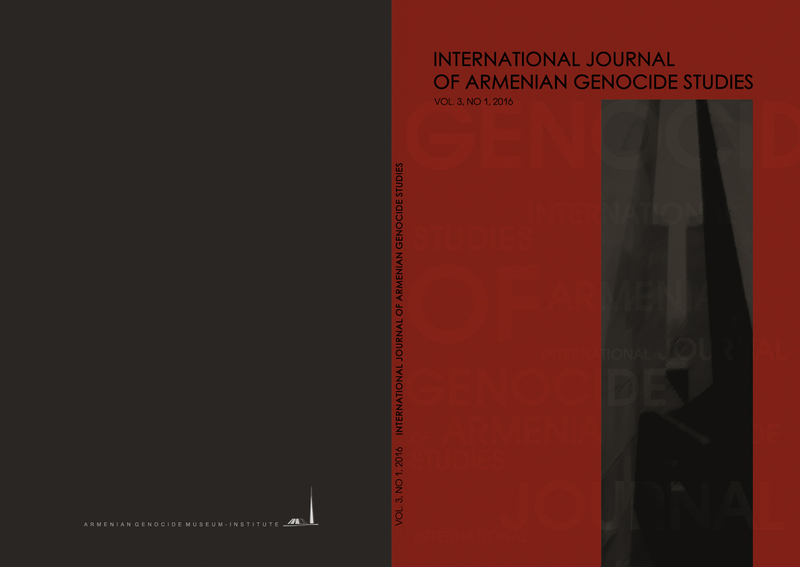 The new volume of English-language periodical вЂњInternational Journal of Armenian Genocide StudiesвЂќ has been published by the Armenian Genocide Museum-Institute. Delegation of the Ministry of Internal Affairs of Georgia, led by Giorgi Gakharia, Vice Prime Minister and Minister of Internal Affairs of Georgia, which has arrived in Armenia on an official visit, visited the Armenian Genocide Memorial Complex and Museum accompanied by Colonel-General of the Police Vladimir Gasparyan, the Head of the Military Police of the RA Ministry of Defence. Vice Prime Minister and Minister of Internal Affairs of Georgia Giorgi Gakharia laid a wreath at the Monument, and the members of delegation put flowers at the eternal fire, by honoring the memory of the innocent martyrs with a minute of silence. 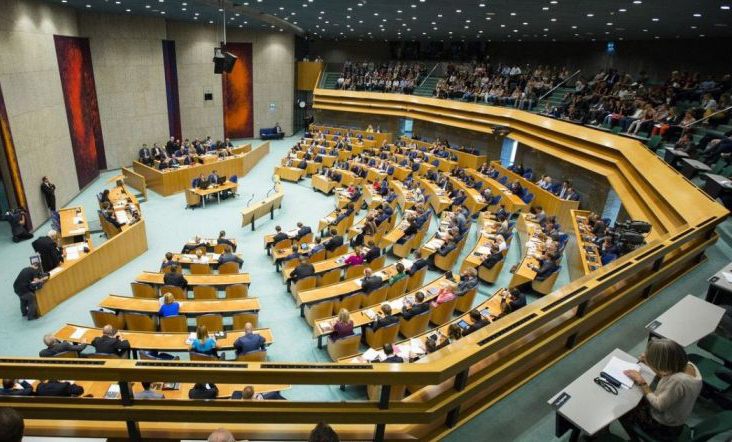 By majority of votes the Lower house of the Dutch Parliament (Tweede Kamer) adopted two motions regarding the Armenian Genocide of 1915. One of the motions states that the Lower House вЂњrecognizes the Armenian GenocideвЂќ. According to the second motion, A Dutch Minister or State Secretary should attend the commemoration of the Genocide in Armenia in April. Immediately after the vote, the Armenian Foreign Minister Edward Nalbandian stated that вЂњArmenia highly appreciate the debates held in the Parliament of friendly Netherlands and the decisions adopted as a result, which unequivocally reaffirm the recognition of the Armenian Genocide back in 2004. 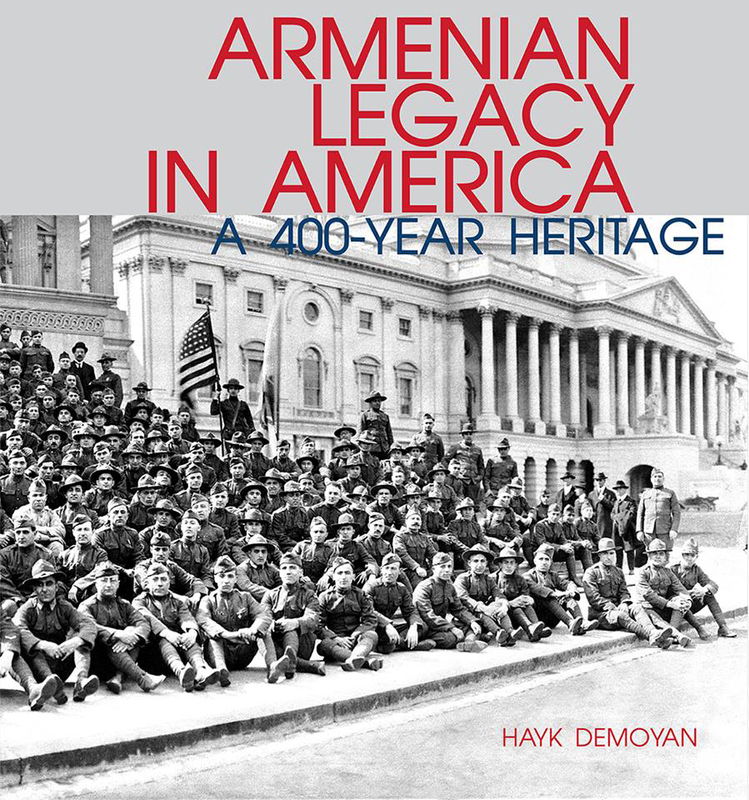 New monograph by Doctor of Historical Sciences Hayk Demoyan titled вЂњArmenian Legacy in America: A 400-year HeritageвЂќ has been published. The book is dedicated to the 400th anniversary of the arrival of the first Armenian to America. In 1618, вЂњMartin the ArmenianвЂќ arrived to Virginia. 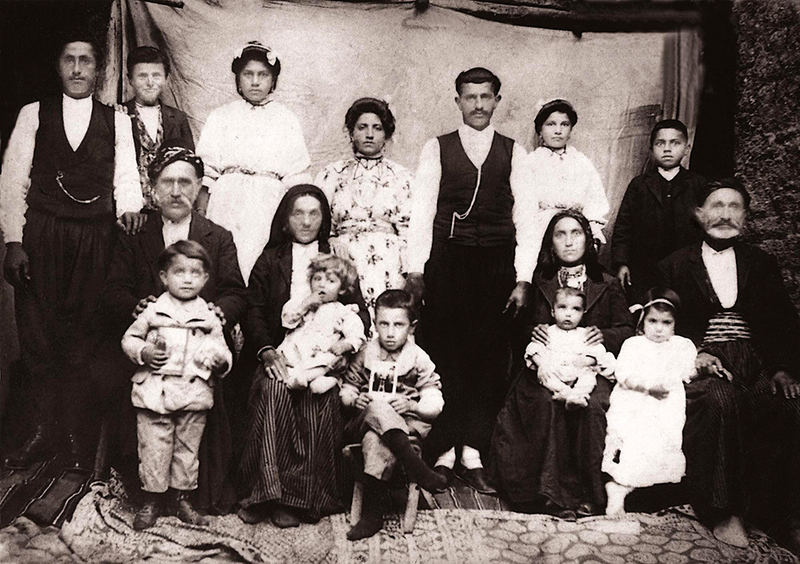 The arrival of the first Armenian also signaled the flow of Armenian refugees, immigrants who brought their own customs, style, cuisine, and mentality to new country. They were students, craftsman, traders, farmers, who came to America to survive, and with great hope to help their families suffering from exploitation and abuse in their homeland. 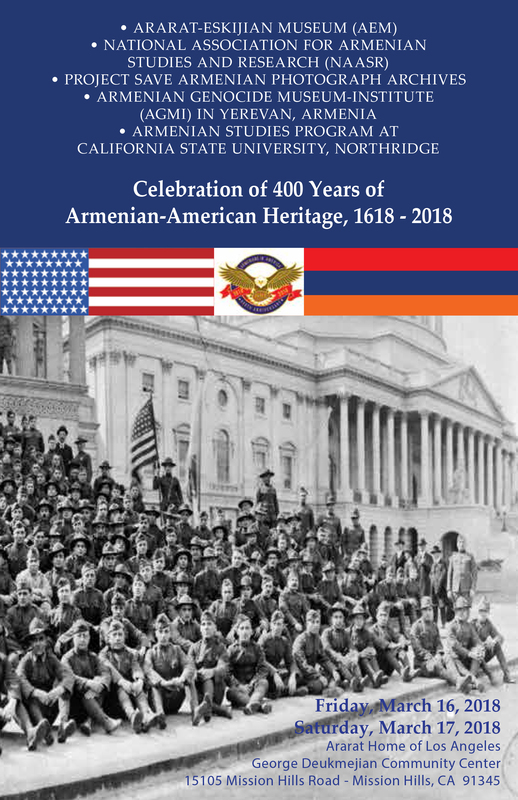 The book is an illustrated addition with 620 pages and more than 2,200 photos, including artifacts, documents and rare images, demonstrating the history and legacy of the Armenian-American community and the important contributions of the Armenian Community. The volume is the first attempt to comprise materials from Armenian institutions of the Republic of Armenia, and the United States. Book chapters and illustrations are presented in chronological order, covering the time period from 1618 until the early 1990вЂ™s. President of the Republic of Lebanon Michel Aoun, who has arrived in Armenia on a state visit at the invitation of the President of the Republic of Armenia Serzh Sargsyan, visited the Armenian Genocide Memorial Complex and Museum accompanied by the RA Minister of Territorial Administration and Development Davit Lokyan and Mayor of Yerevan Taron Margaryan. Acting Director of the Armenian Genocide Museum-Institute Gevorg Vardanyan introduced to the President of Lebanon the construction history of the memorial complex and its symbolism. The president of Lebanon laid a wreath at the Monument, and the members of delegation put flowers at the eternal fire, by honoring the memory of the innocent martyrs with a minute of silence. Dr. Hayk Demoyan will take part at the conference dedicated to the 400 years of Armenian-American heritage titled вЂњCelebration of 400 years of Armenian-American heritage, 1618-2018вЂќ on March 16, 2018, at the Ararat Home of Los Angeles, George Deukmejian Community Center. He has been a key collaborator in organizing the conference and exhibition. In conjunction with the conference, a special exhibition prepared for the occasion will be on display featuring Armenian-American heirlooms and historical artifacts from the Ararat-Eskijian Museum and from the private collection of Dr. Hayk Demoyan. Rebecca Jinks, the first recipient of the Armenian Genocide Museum-Institute's Rafael Lemkin Scholarship, has published an article in the American Historical Review. The article titled вЂњMarks Hard to Erase. The Troubled Reclamation of вЂњAbsorbedвЂќ Armenian Women, 1919вЂ“1927вЂќ, is dedicated to the tragic fate of Armenian women during the Armenian Genocide. Original sources and photos from the AGMI collections were used in the article. American Historical Review is a leading English-language scientific journal in the world, with the highest impact factor. It is the official publication of the American Historical Association, now published by the Oxford University Press. Rafael Lemkin Scholarship was established by the Armenian Genocide Museum-Institute in 2011 with a view to engage young and promising scientists from around the world in the study of the Armenian Genocide. 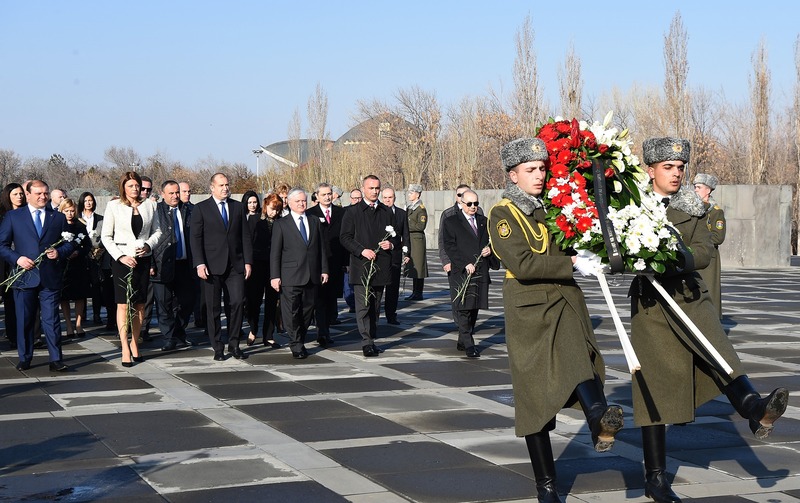 President of the Republic of Bulgaria Rumen Radev, who has arrived in Armenia on a state visit at the invitation of the President of the Republic of Armenia Serzh Sargsyan, visited the Armenian Genocide Memorial Complex accompanied by Armenian Foreign Minister Edward Nalbandian and Mayor of Yerevan Taron Margaryan. 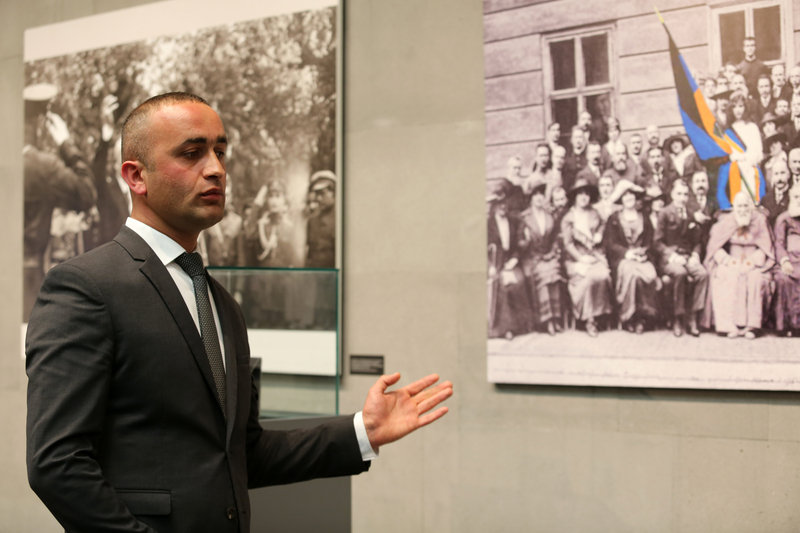 Acting Director of the Armenian Genocide Museum-Institute Gevorg Vardanyan presented the history of construction of the memorial complex and its symbolism. 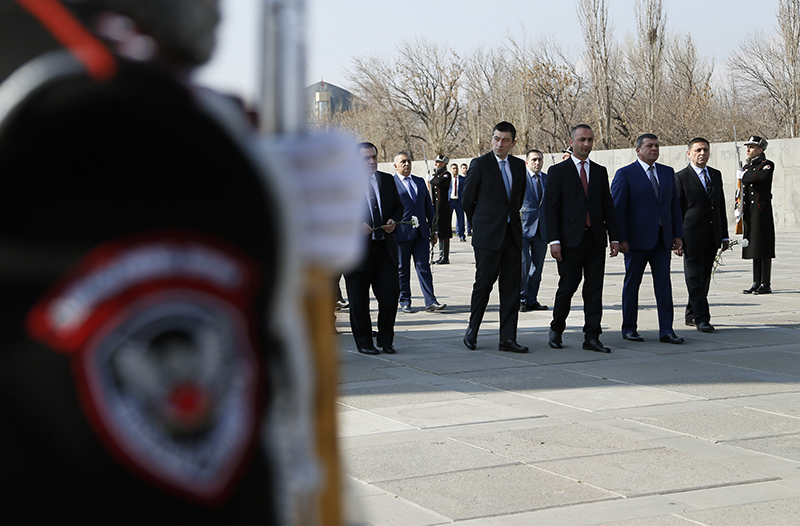 The president of Bulgaria laid a wreath at the Monument, and the members of delegation put flowers at the eternal fire, by honoring the memory of the innocent martyrs with a minute of silence. 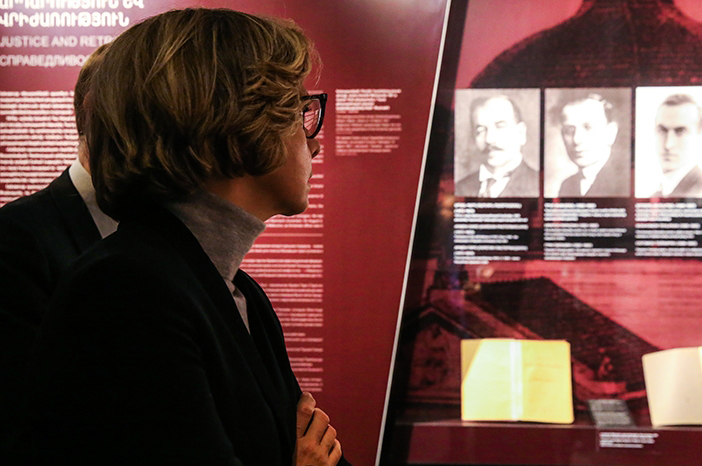 The President and his delegation also visited the Armenian Genocide Museum, where AGMI deputy director Lousine Abrahamyan presented the history of the first Genocide of the 20th century. At the end of the tour President Rumen Radev left a note in the Book of Honorable Guests. AGMI Acting Director Gevorg Vardanyan handed Golden Medal for high-ranking guests visiting the museum to the President of Bulgaria. 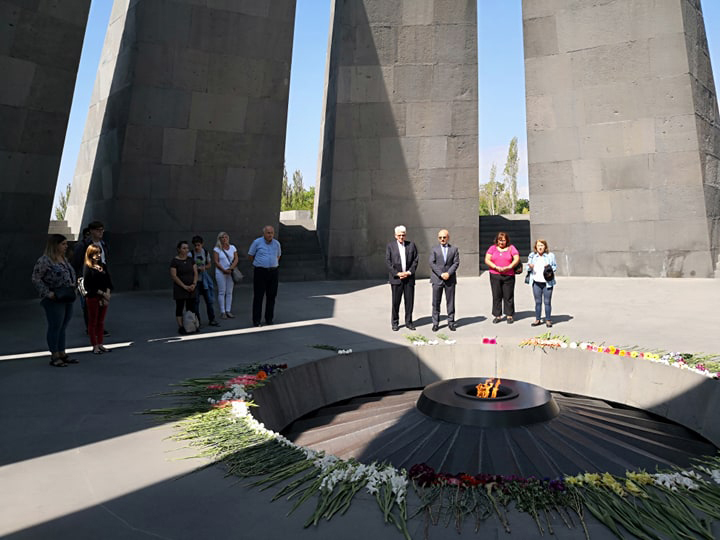 The newly appointed Ambassador Extraordinary and Plenipotentiary of Poland to Armenia PaweЕ‚ Cieplak visited the Armenian Genocide Memorial Complex. He laid a wreath at the Monument, and then the members of the delegation put flowers at the eternal fire, honoring the memory of the innocent martyrs with a minute of silence. The Ambassador was welcomed by Gevorg Vardanyan, AGMI Acting Director, and introduced to the history of construction of the memorial complex, and its symbolism. 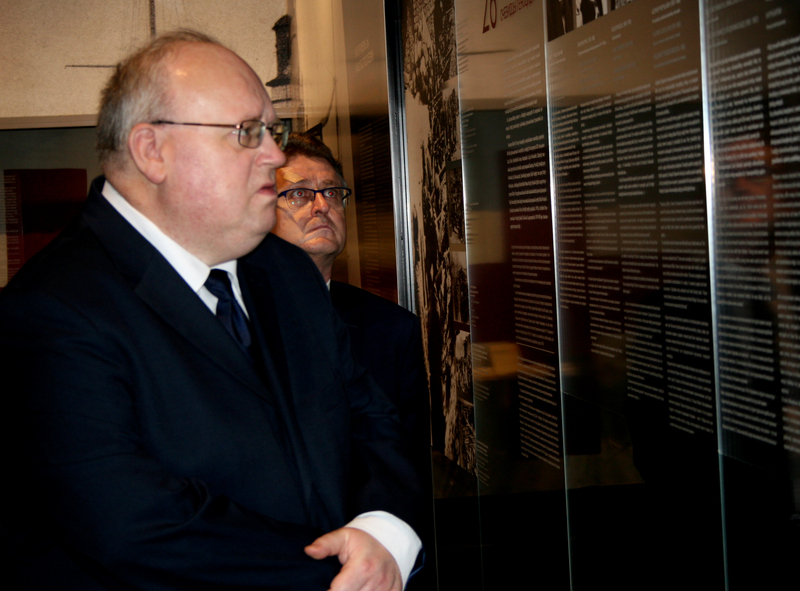 The delegation from Poland also visited the Armenian Genocide Museum. AGMI Deputy Director Lousine Abrahamyan introduced museum exhibits and presented the history of Armenian Genocide. The memoir of Hayk Aharonyan, a survivor of the Armenian Genocide, has been written down by his son Emanuele Sergio Aharonyan. By doing this work he mentions that when these stories are not written down directly by the survivors, they lose their вЂњflavorвЂќ. The father of the person, who wrote the memoir, Hayk Aharonyan, was born on May 25, 1905, in Sebastia, attended an Armenian private school. One day Turks told them, that they were deporting all the Armenians. 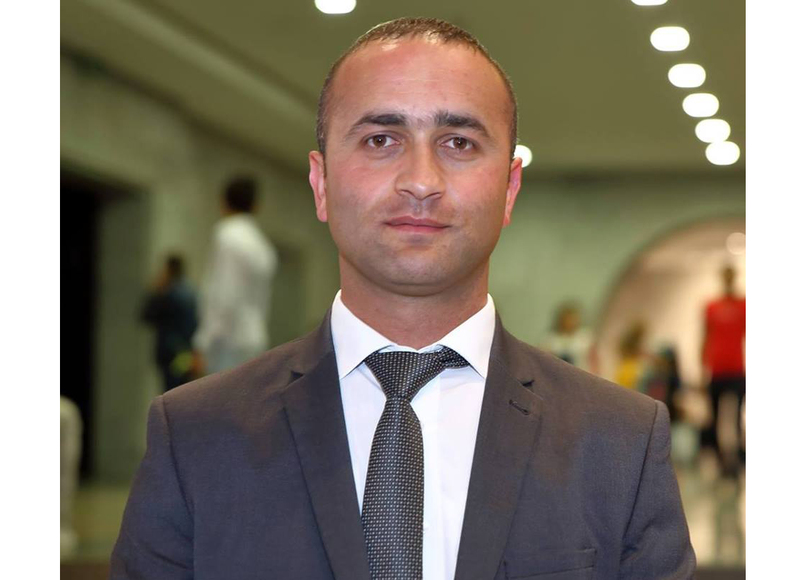 They offered to the family to convert to Islam and stay, but HaykвЂ™s father Manuel, answered, that he was born Christian and would die Christian. 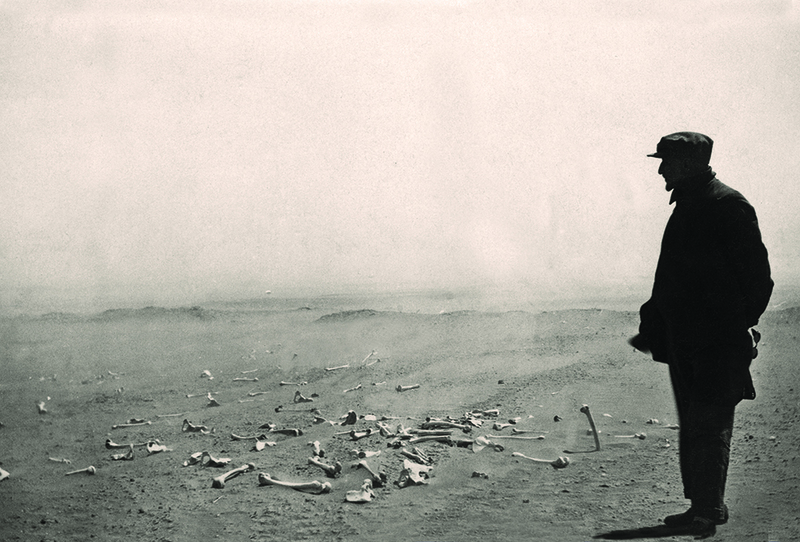 During the Armenian Genocide, Aharonyan lost eighty-four relatives. Only one, Levon Darbinyan, succeeded to cross the Russian border and to find shelter in Eastern Armenia. A Turk took Hayk to his farm in Malatya, where he worked nine years for him. He mentioned that by this the Turk saved his life, as six-seven years old children or over were killed because they would remember, that they were Armenians and Christians. After shooting two neighbors by the master's indication, he was offered to escape to Malatya. 19 years old Hayk encountered many difficulties and returned to Sebastia. He went to his fatherвЂ™s house and found out, that a Turkish family was leaving there. When he announced, that the house belonged to his family, the Turks answered to him: вЂњGiavur (infidel) go away, otherwise we will cut your head offвЂќ. 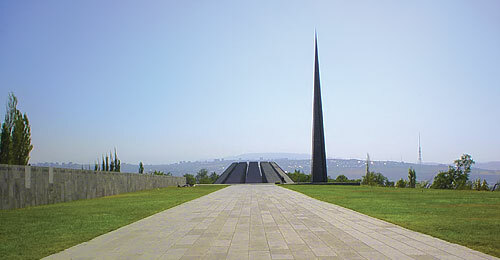 The delegation led by Dominique de Buman, President of the National Council of the Swiss Confederation, accompanied by Lucas Gasser, Ambassador of Switzerland to the Republ;ic of Armenia, and Shirak Torosyan, Member of the Armenian Parliament, visited the Armenian Genocide Memorial Complex. The guests were welcomed by Gevorg Vardanyan, AGMI Acting Director, and introduced to the history of construction of the memorial complex and its symbolism. Dominique de Buman laid a wreath at the Genocide Monument, and put flowers at the eternal fire, by honoring the memory of the innocent martyrs with a minute of silence. Marash was one of the densely-populated and rich cities of historic Cilicia. Before the Armenian Genocide it had about 40.000 Armenian population, which was engaged in crafts, trade and agriculture. In 1915 Marash Armenians were deported from their native city, many of them were massacred during deportation. A part of Armenians (about 25.000 people) that had been deported from Marash in 1915 and legionaries who had fought in French army, returned to city after the defeat of Turkey in WWI and the conclusion of Mudros Treaty in October 30, 1918, as soon as the Turks left Cilicia. With the extension of Kemalist-nationalist movement Turkish authorities started devising plans for removing French garrison from Marash at the point of bayonet and massacring Armenian population of the city. 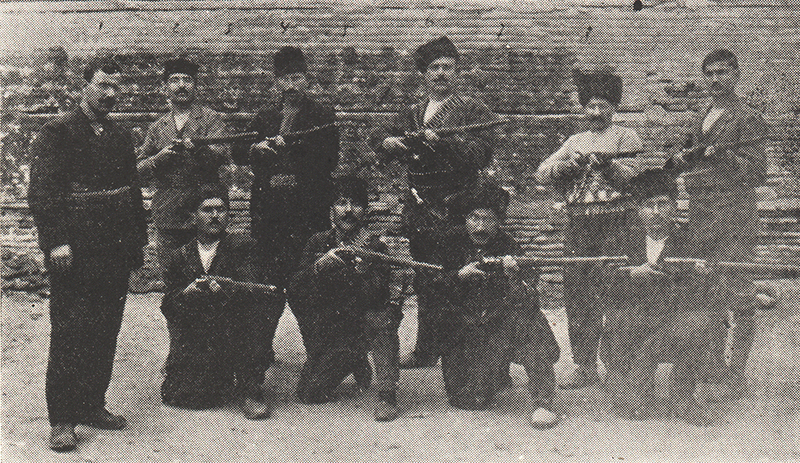 In order to carry out those plans Turkish authorities first armed local Muslim mobs, instilled hatred against Marash Armenians by organizing constant disturbances. 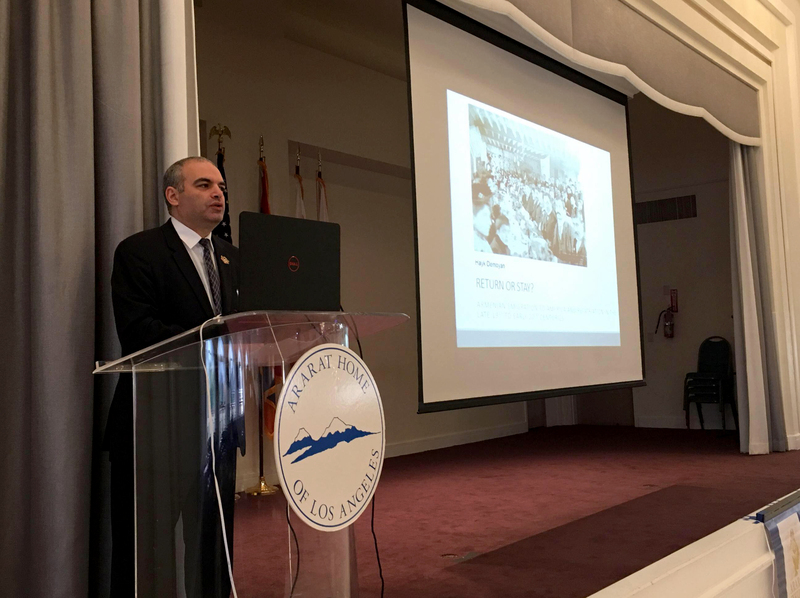 Thanks to the efforts of the Armenian Genocide Museum-Institute, the Archive of the American-Armenian family, who survived the Armenian Genocide, has been donated to the Museum. 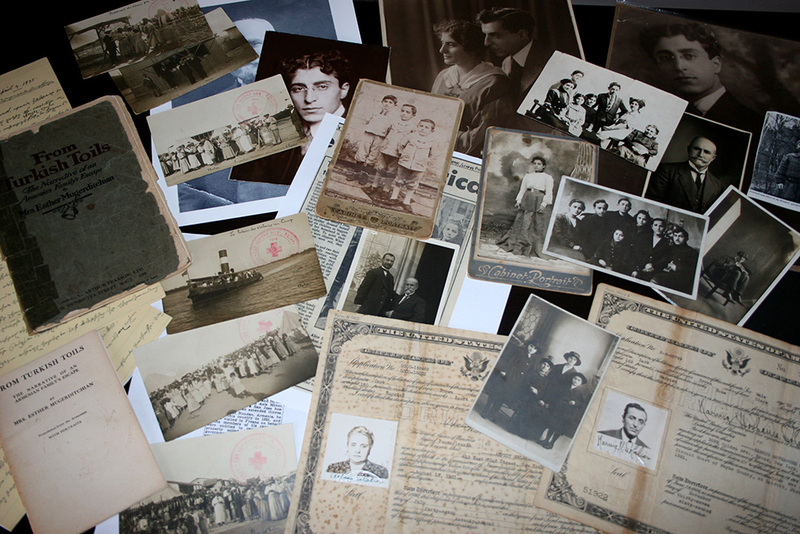 American-Armenian Susan Solakyan donated a great history of her big family to The Armenian Genocide Museum-Institute, which includes memoirs, documents and photos. Of course he is sure, that their family relics appear in caring hands, and the goal is to transfer the most important thing, the memory, to the generations. 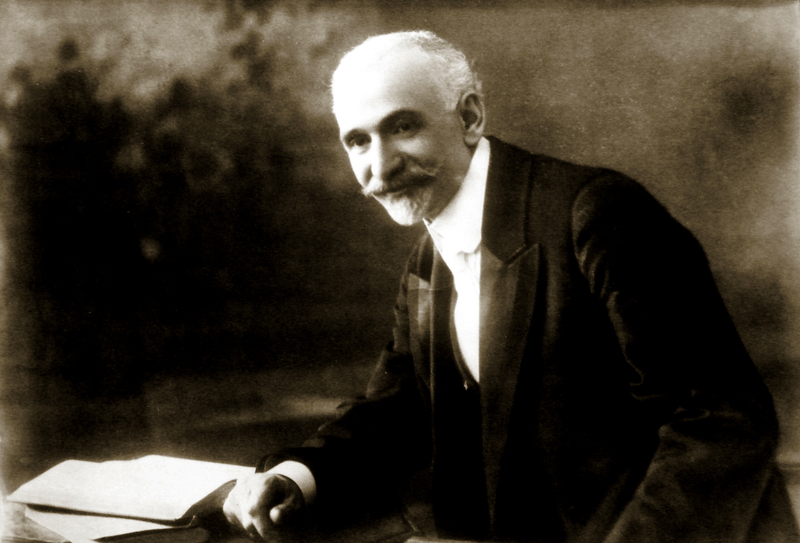 Over one-century-old history of Tomas and Estern Mkrtchyan, who were from Mezre (Kharberd province), from being deported from their historical homeland up to settling in the United States, is rich with the accurate historical information, as well as the most severe manifestations of human loss. The Armenian Genocide Museum-Institute will be closed on January 28th, 2018. Atlas of the Armenian Genocide in English language was published by Babken Harutyunyan Laboratory of Armenian Historical Geography and Cartography. The research has been carried out by Vardan Mkhitaryan, head of Laboratory. The Armenian Genocide Museum-Institute has participated in the preparation of the Atlas. The Atlas presents various issues and historical events related to the Armenian Genocide: Armenian-Turkish war, Hamidian massacres, massacres of eastern Armenians, May victories, massacres of Armenians in Baku, cultural genocide, formation of Diaspora etc. Atlas also includes agreements, documents and pictures. The role of Armenians in the Ottoman and Russian Empires is also presented in the Atlas. There is also a reference to the international recognition and condemnation of the Armenian Genocide in the last part of the publication. Awarding ceremony of the winners of the International ChildrenвЂ™s Exhibition of Fine Arts Lidice (ICEFA Lidice) was held at the temporary exhibition hall of the Armenian Genocide Museum-Institute. Peter Mikiska, Ambassador Extraordinary and Plenipotentiary of the Czech Republic to the Republic of Armenia, hosted the ceremony and handed over the prizes to the winners. AGMI Acting Director Gevorg Vardanyan gave a welcome speech, stressing the role of such events in shaping childrenвЂ™s worldview. Gevorg Vardanyan expressed his great whish that all children in the world live in peace and never see tragedies like Lidice. The Ambassador thanked the Armenian Genocide Museum-Institute for supporting the event. The 45th edition (2017) of the exhibition was dedicated to the theme of вЂњTravelingвЂќ. вЂњHrant, darling, I donвЂ™t remember much about 1915 events, but my biography, as well as those of many other survivors, are documents about the genocideвЂќ. Lusi(n)e Chakir(Chaqr) was a daughter of Efendi Manuel Ashotyan, a craftsman and a father of five from Gyurunts. She was the only daughter of her father, and he used to call her Ahchig (Aghchik (girl in Armenian)), thus her name remained Aghchik. 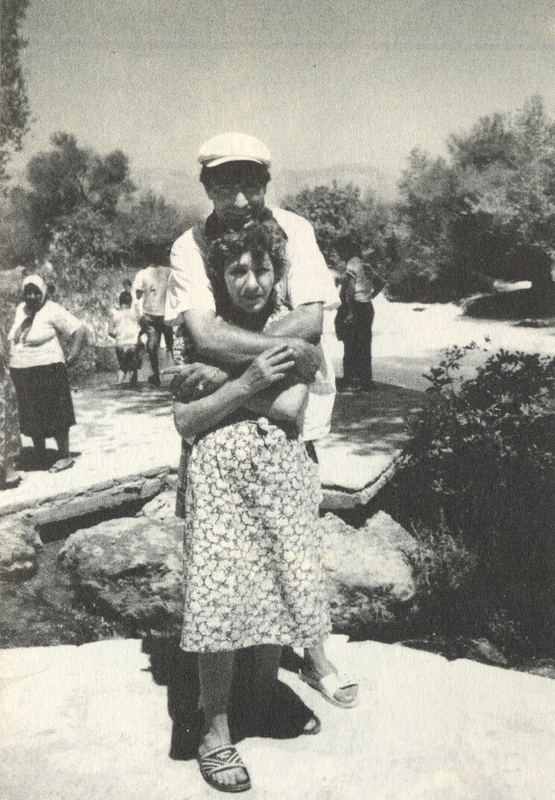 She was one of those little Armenian survivor-girls chosen from the deportation caravans and handled to the Qangal orphanage in Sebastia. Lusie Chakir was Hrant DinkвЂ™s maternal-grandmother. It was 1915. LusieвЂ™s elder brother Artashes had moved to the USA to get education. As her relatives recalled based on her stories, the entire family was impatiently waiting for a letter from Artashes. In the evening there was a knock on the door, but a policeman instead of a postman was standing on the door. Nearly 25 new photos depicting the evacuation of the participants of Musa Dagh heroic battle by the French warships have been discovered by the efforts of the Armenian Genocide Museum -Institute. The original photos were taken by the French navy officer in September 1915. The photos depict evacuation of the Armenian civilians by the boats to the warships. The new photos will be available to the public in April 2018.